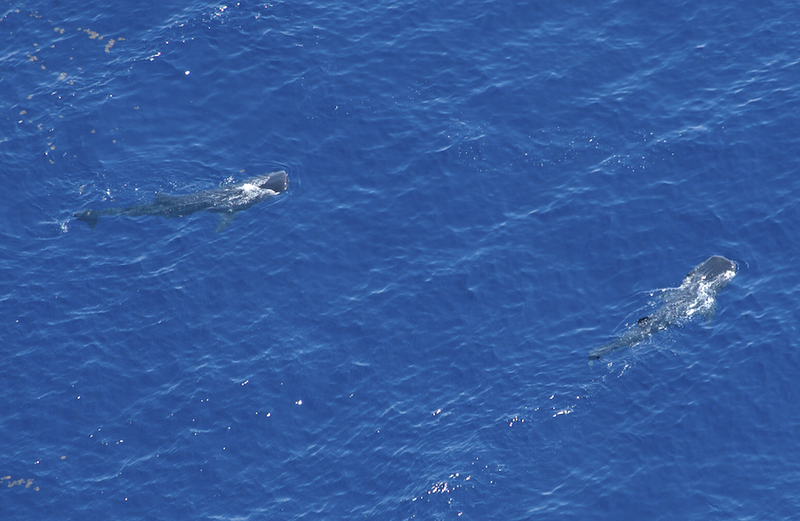 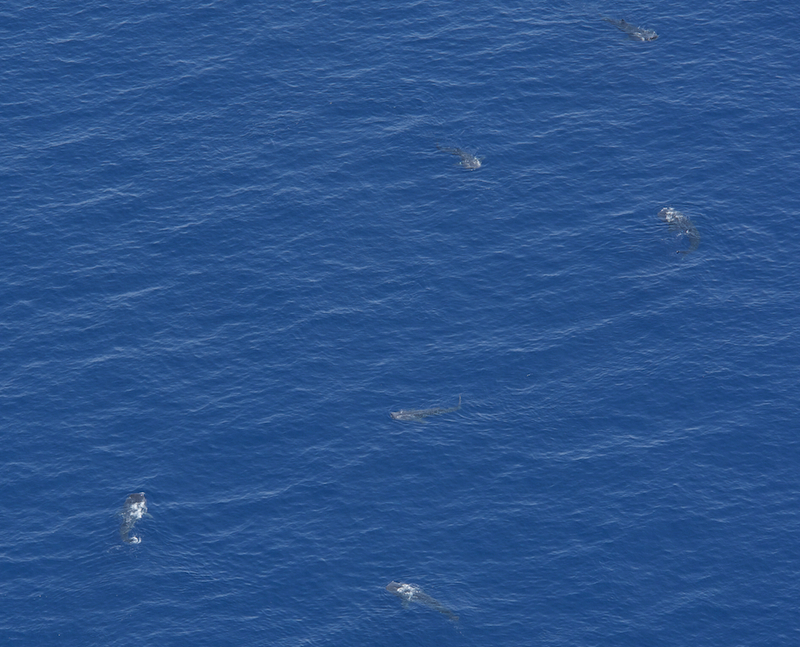 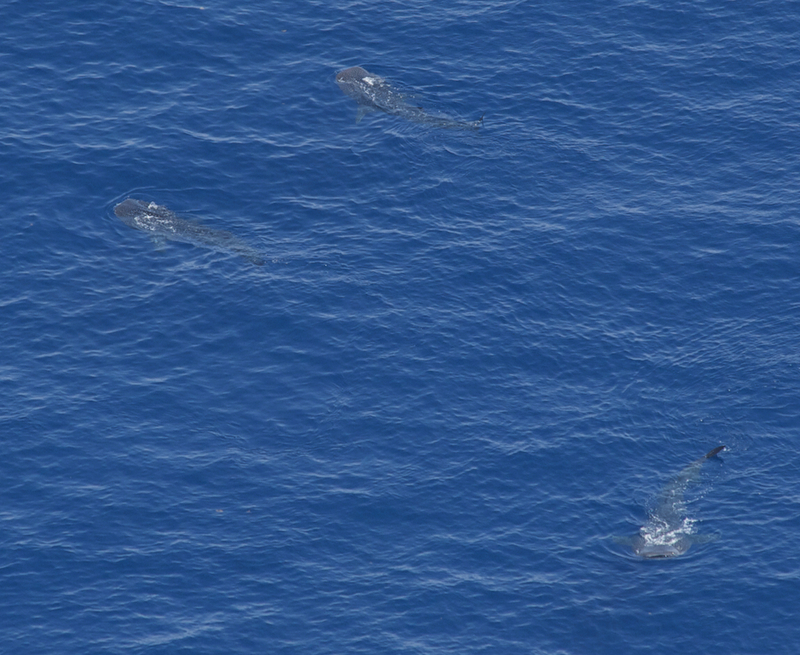 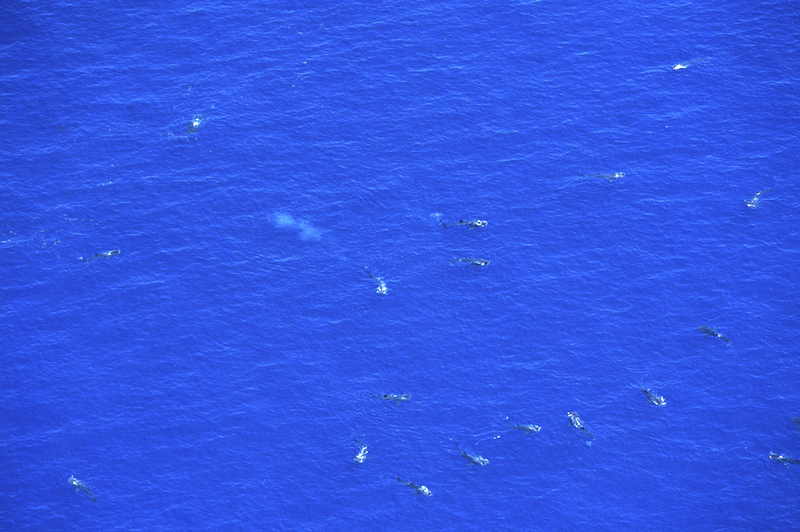 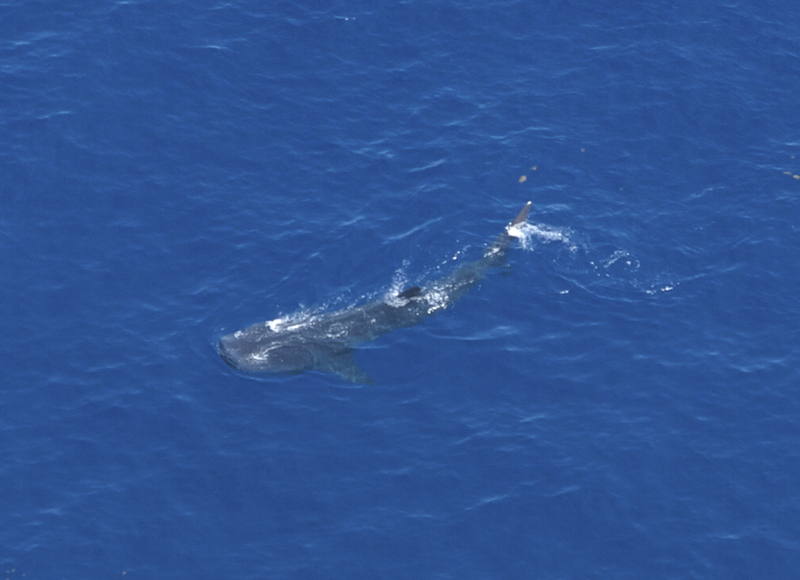 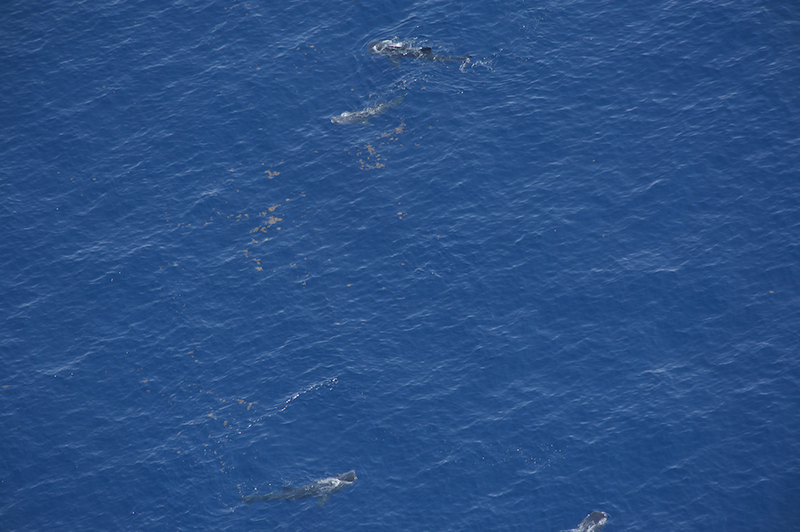 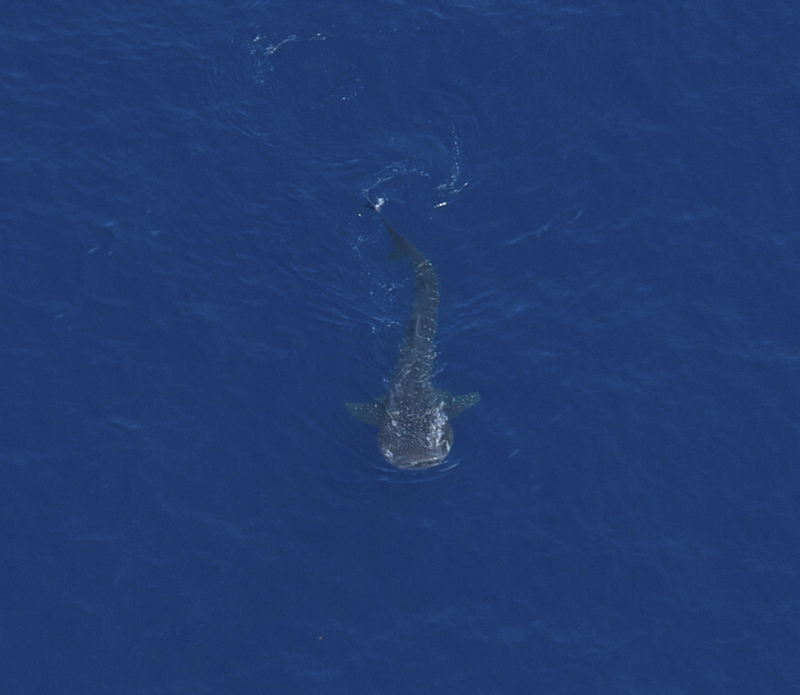 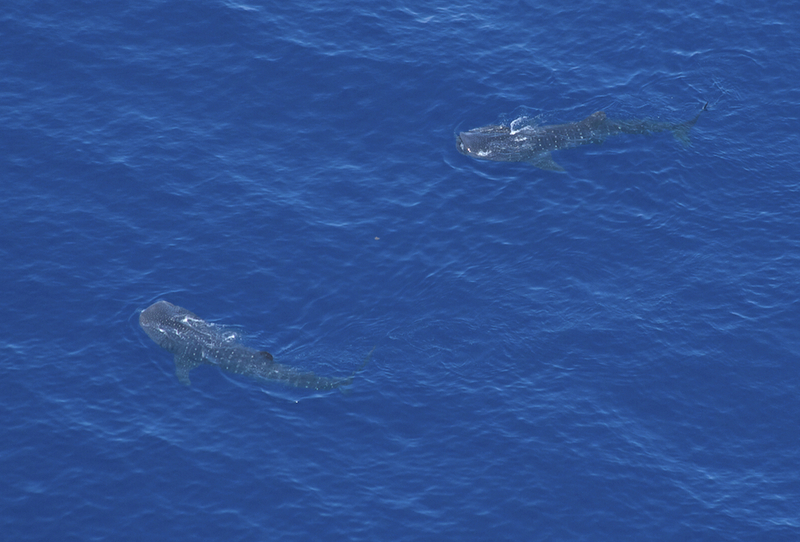 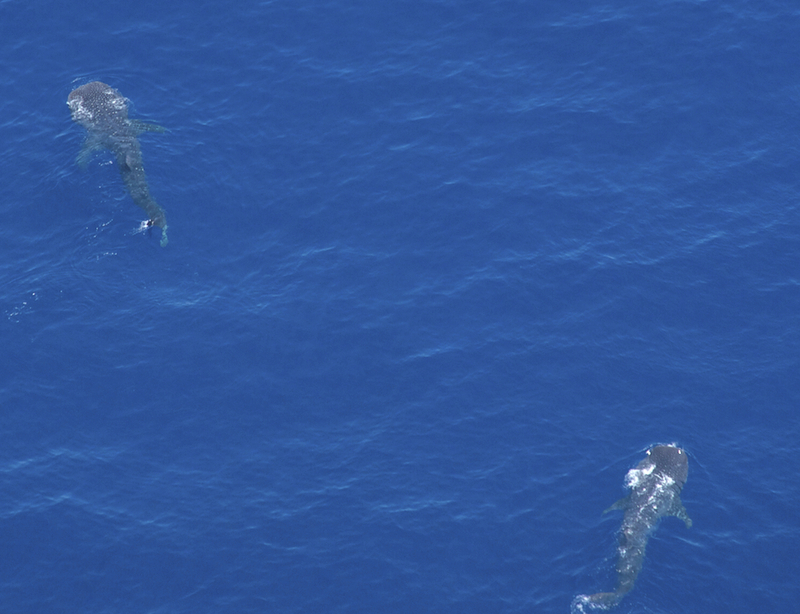 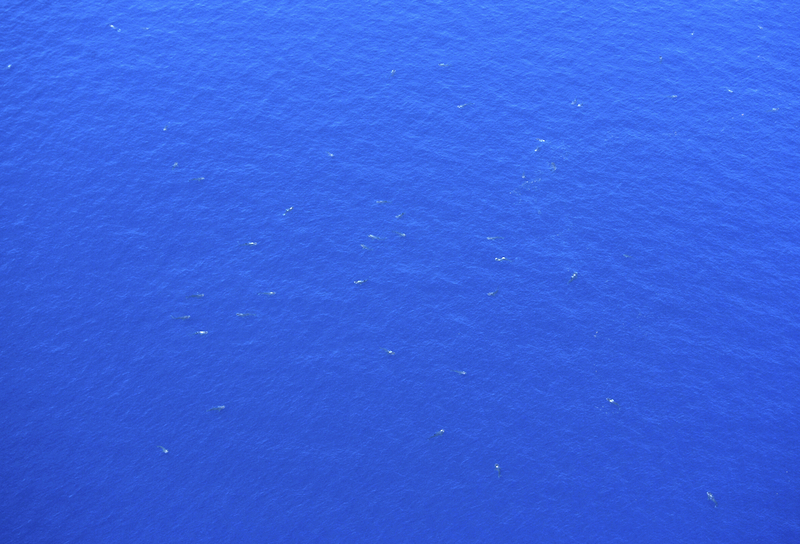 Within ten miles of where we have seen groups of whale sharks in the past, today we found the largest aggregation reported in this area of the Gulf of Mexico since June of 2010! 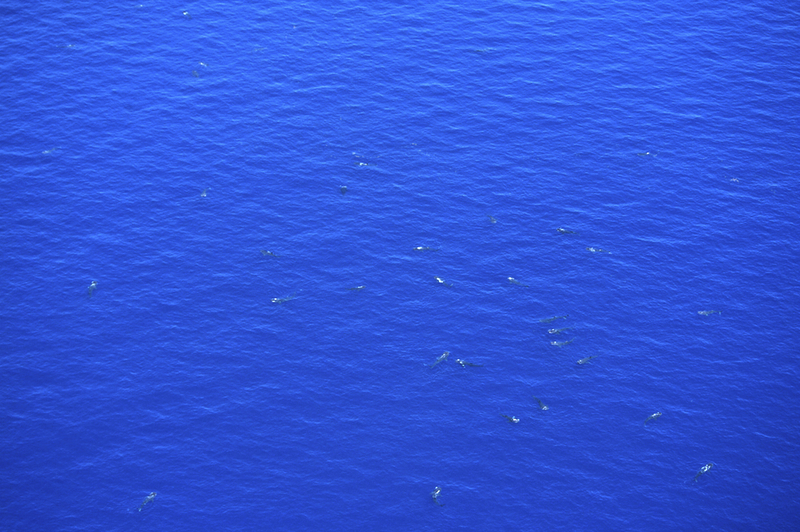 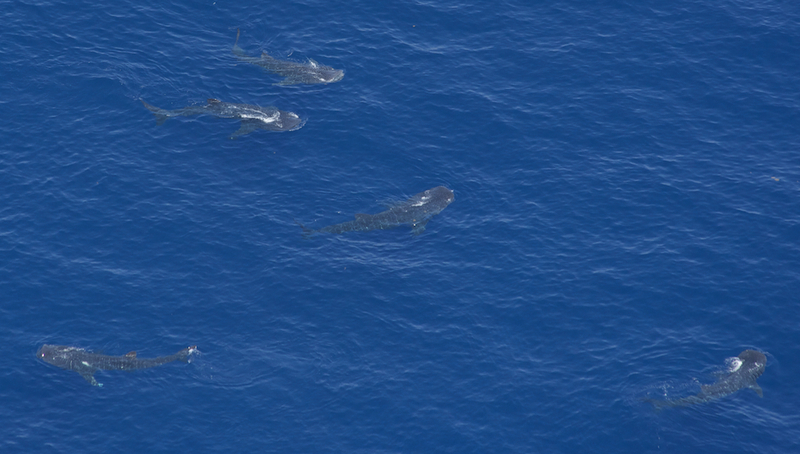 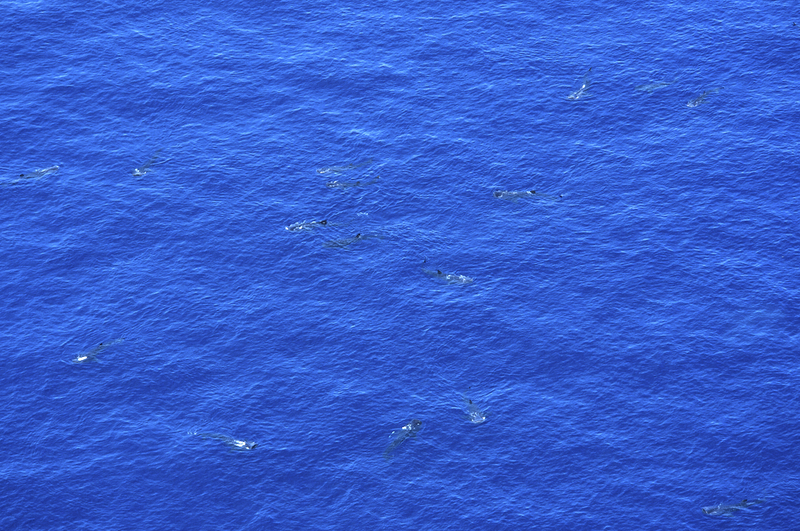 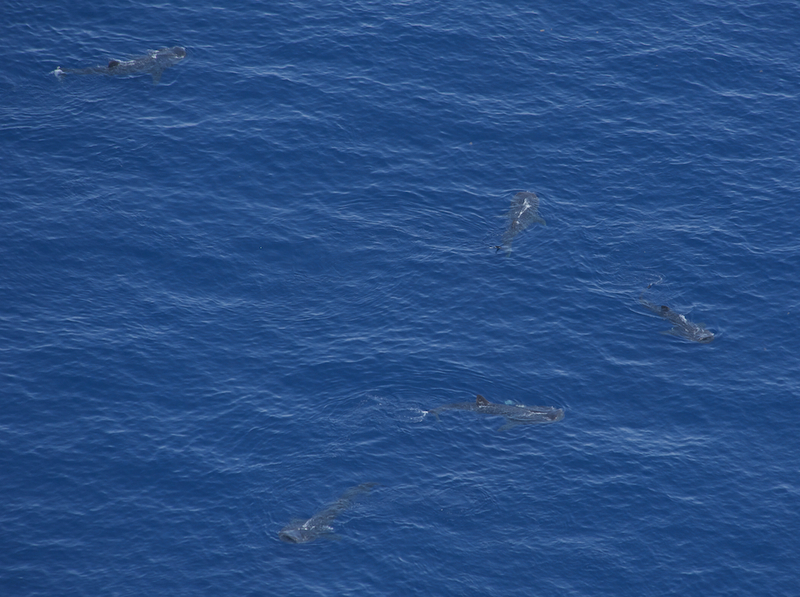 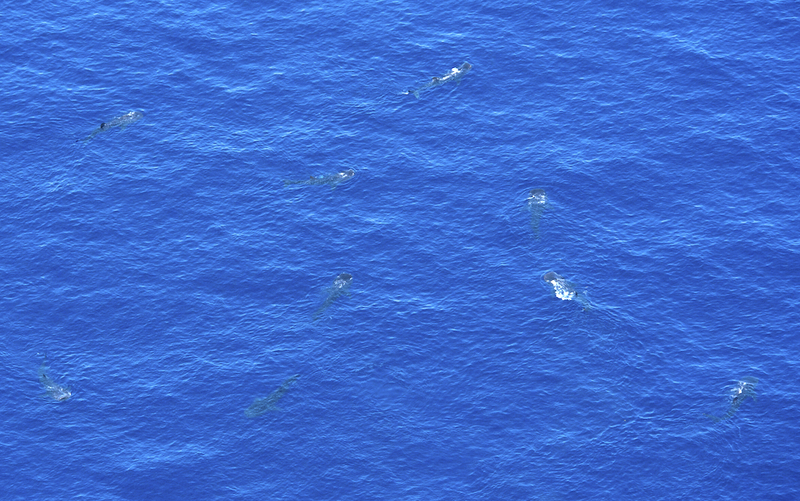 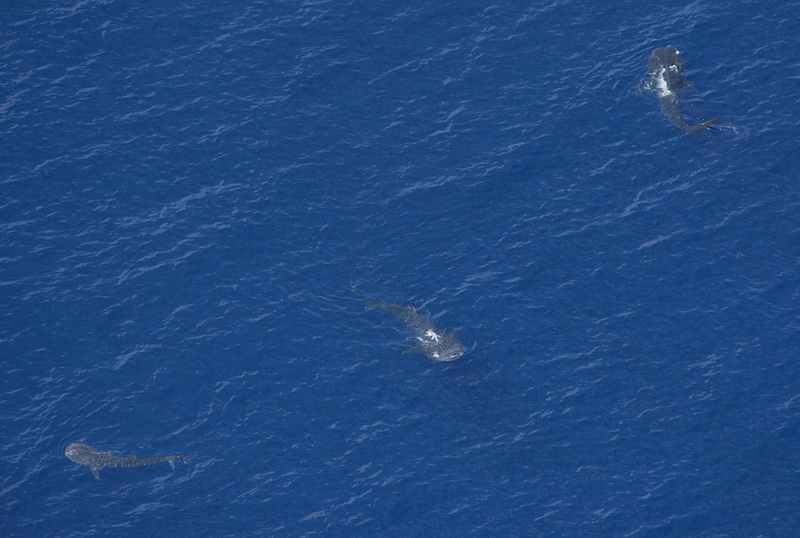 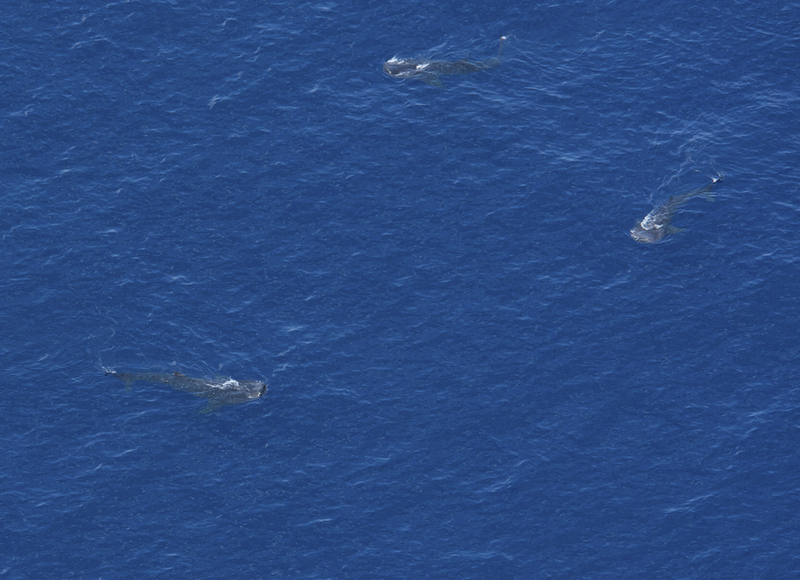 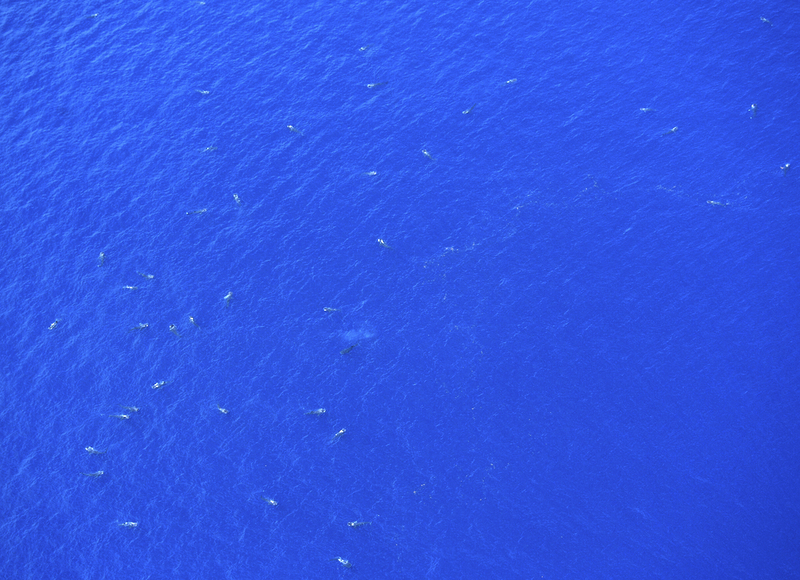 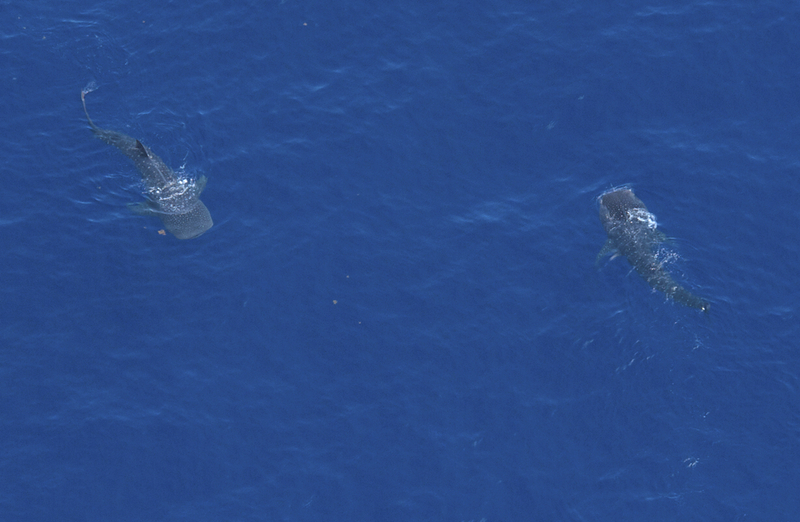 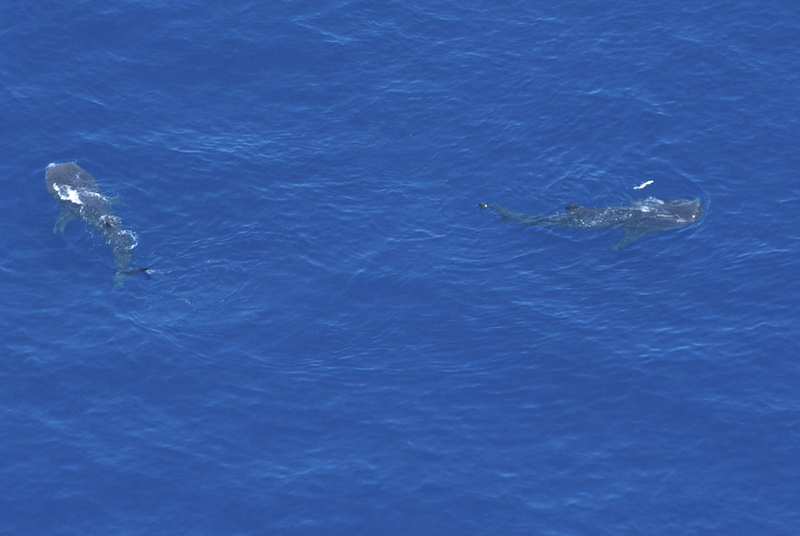 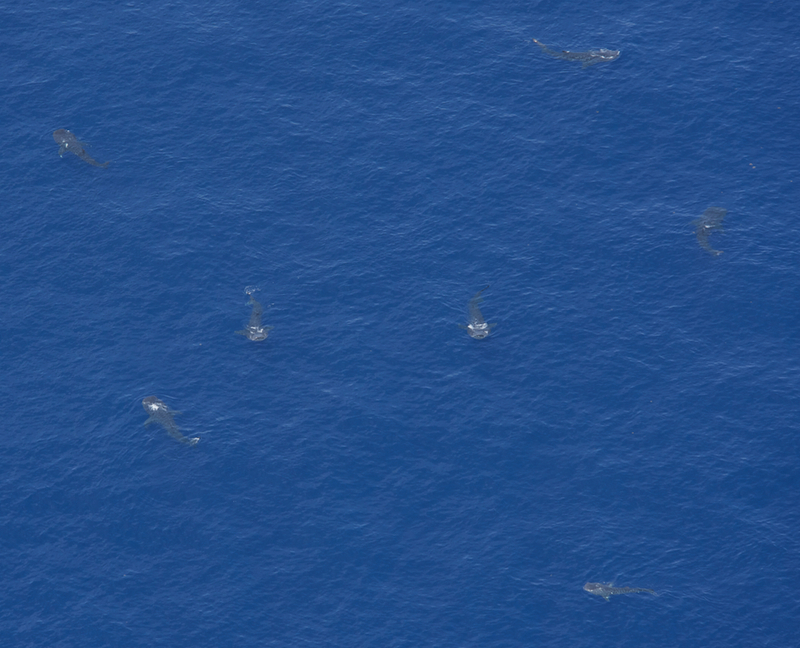 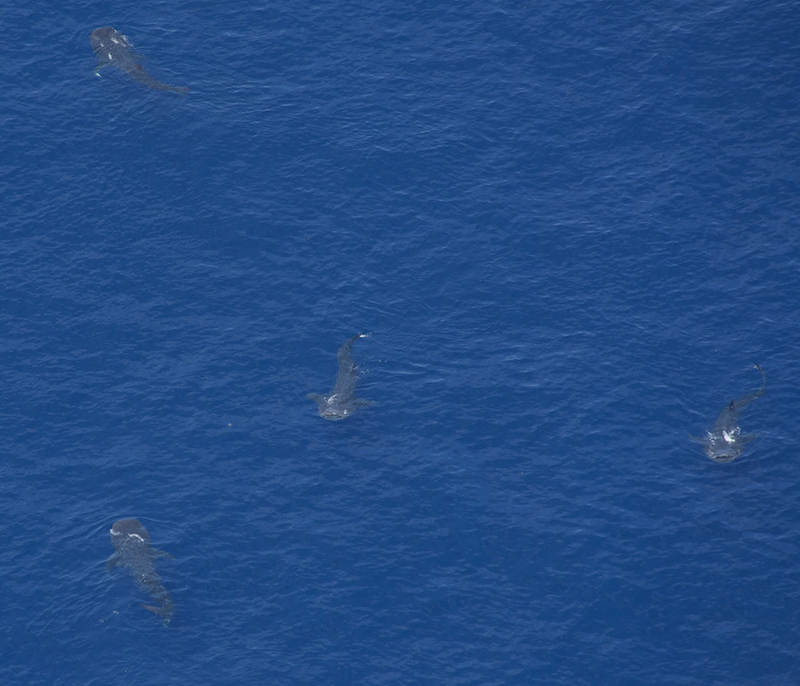 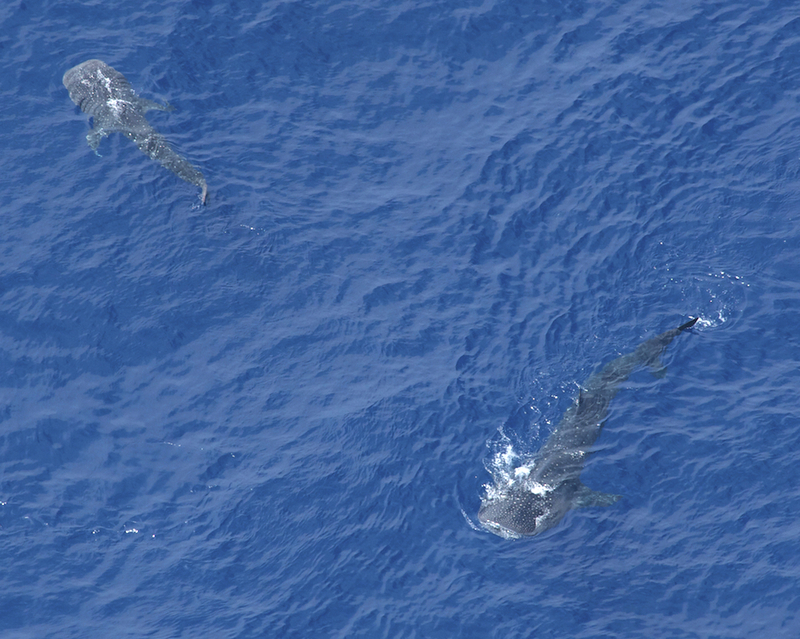 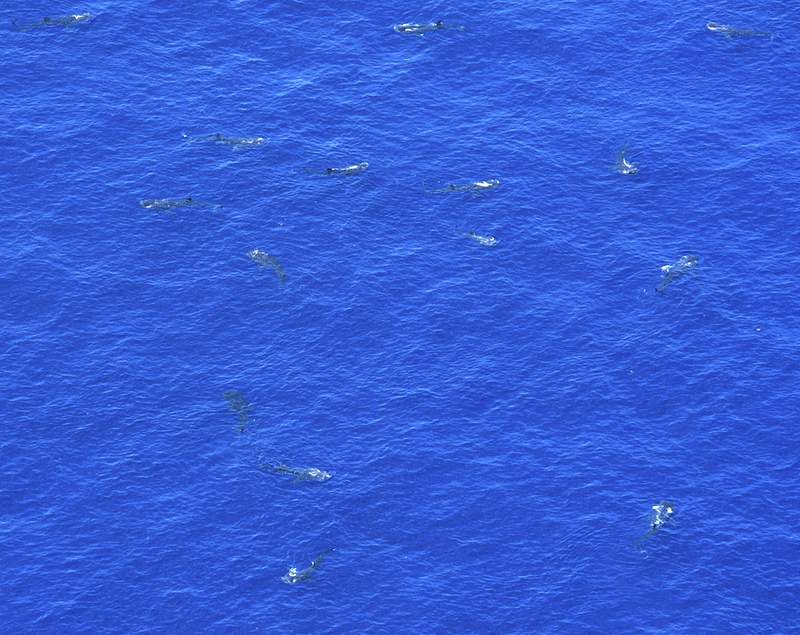 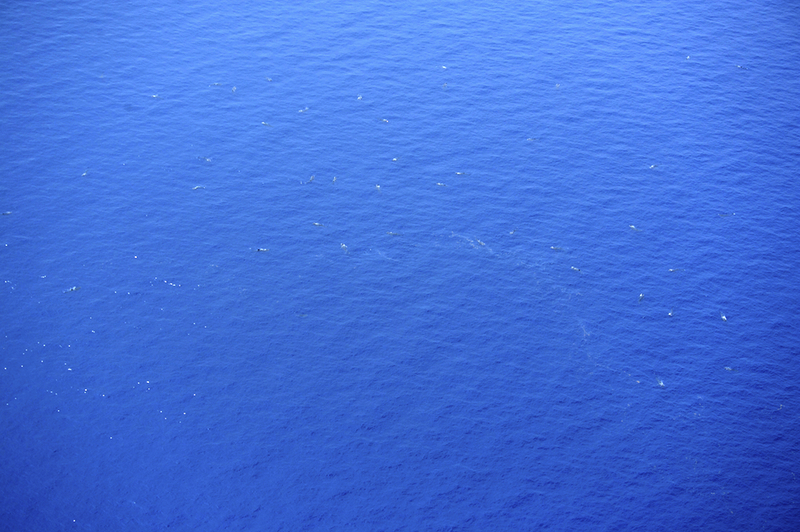 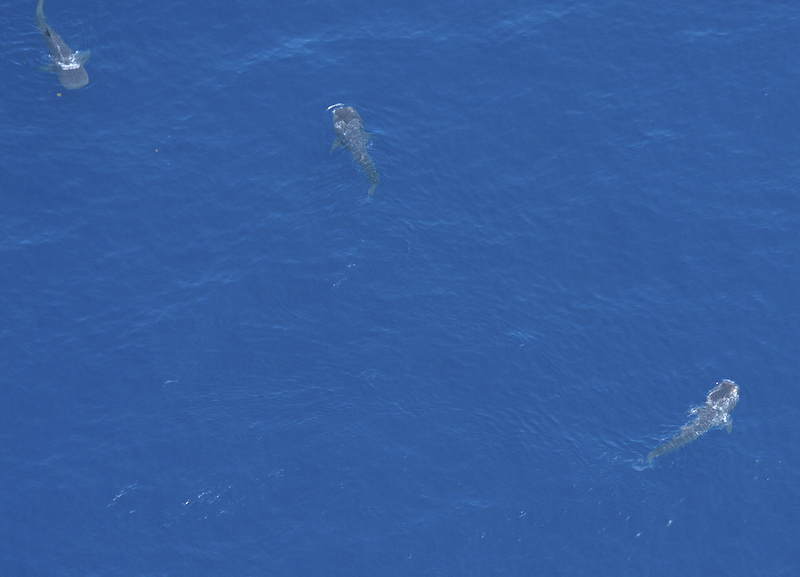 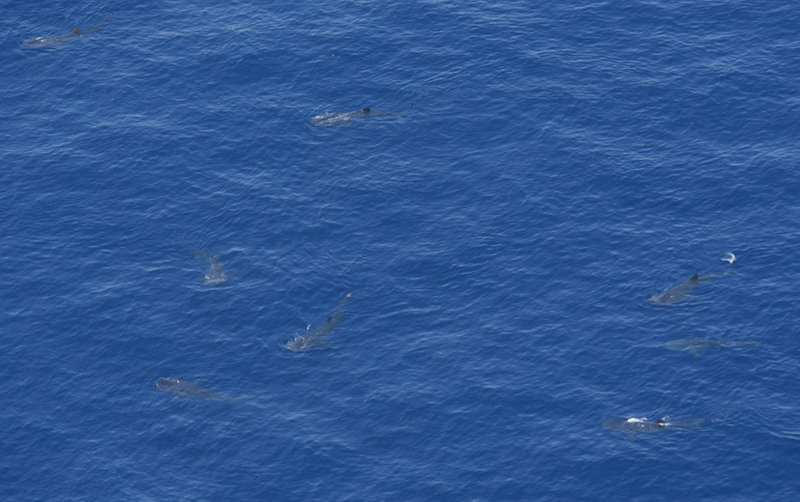 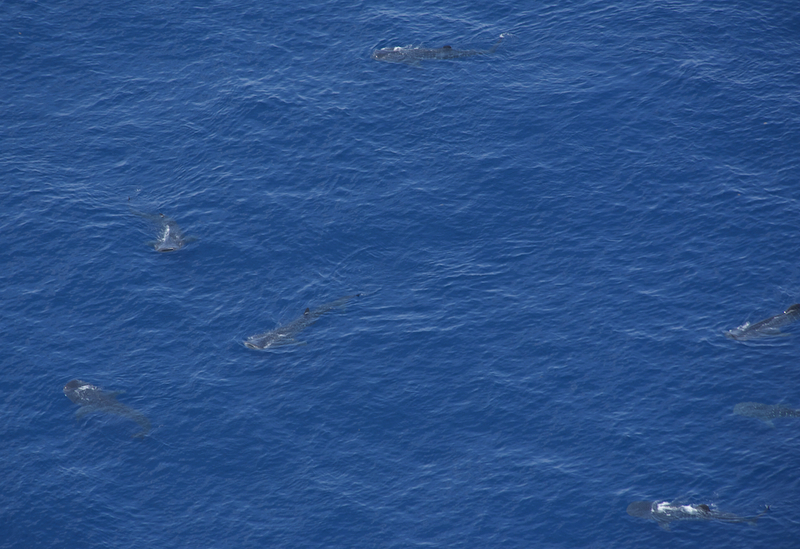 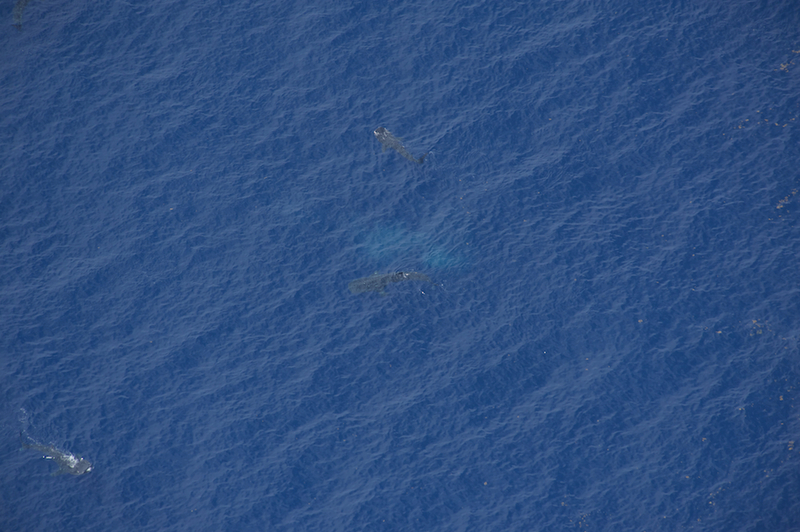 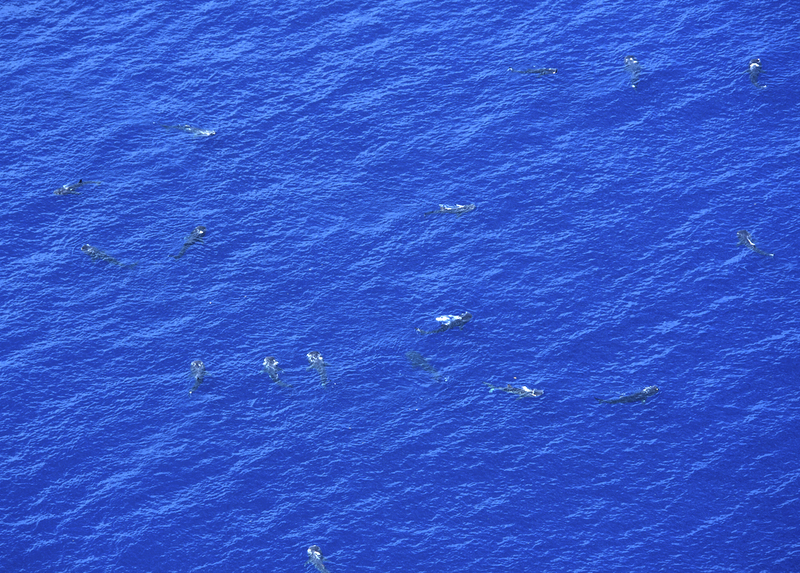 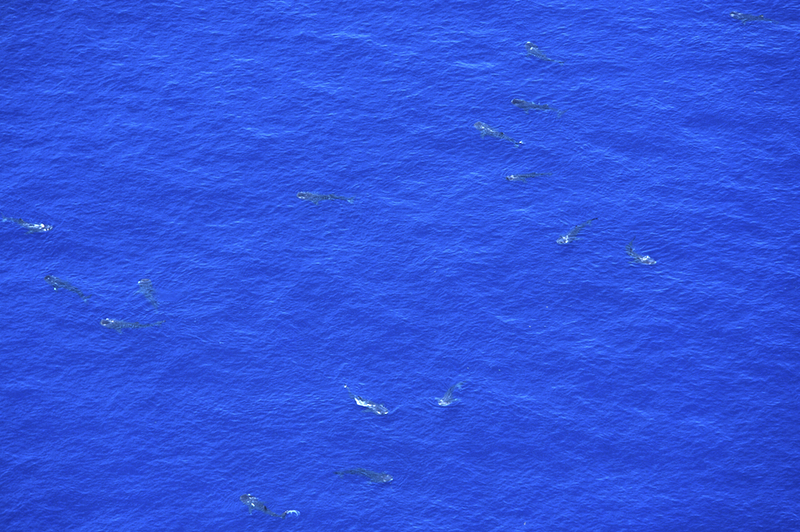 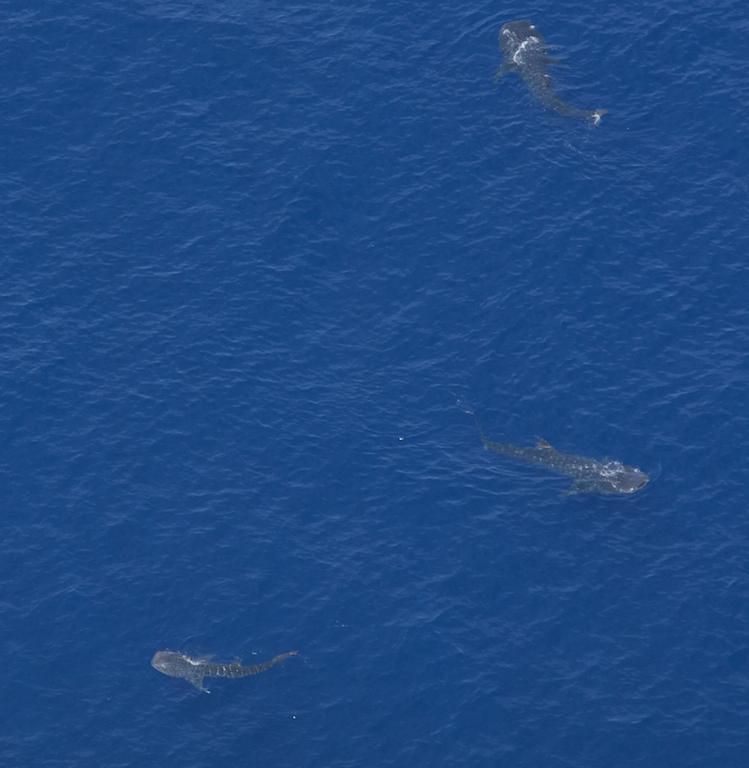 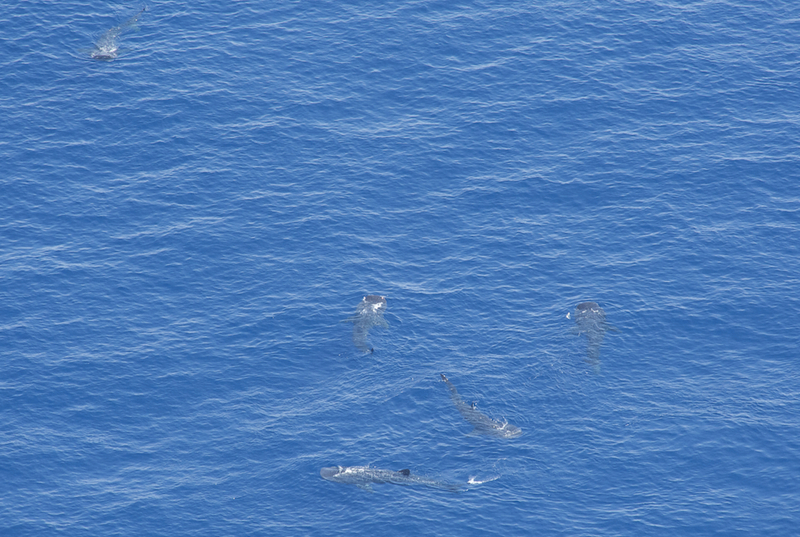 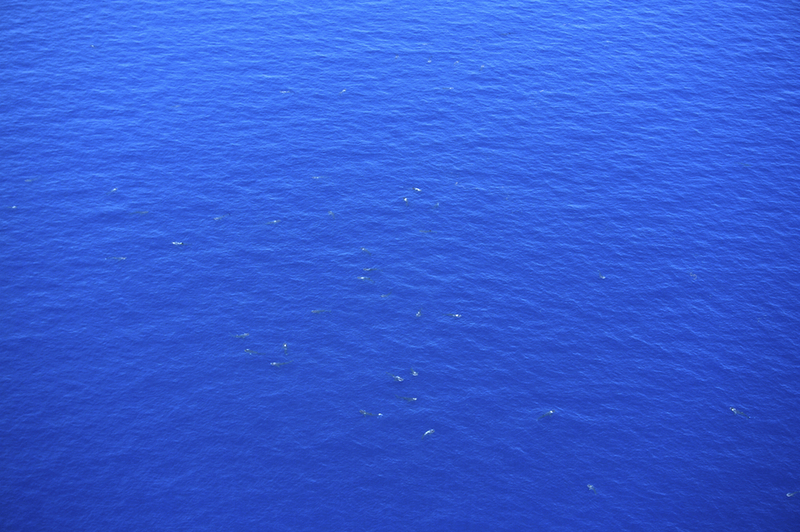 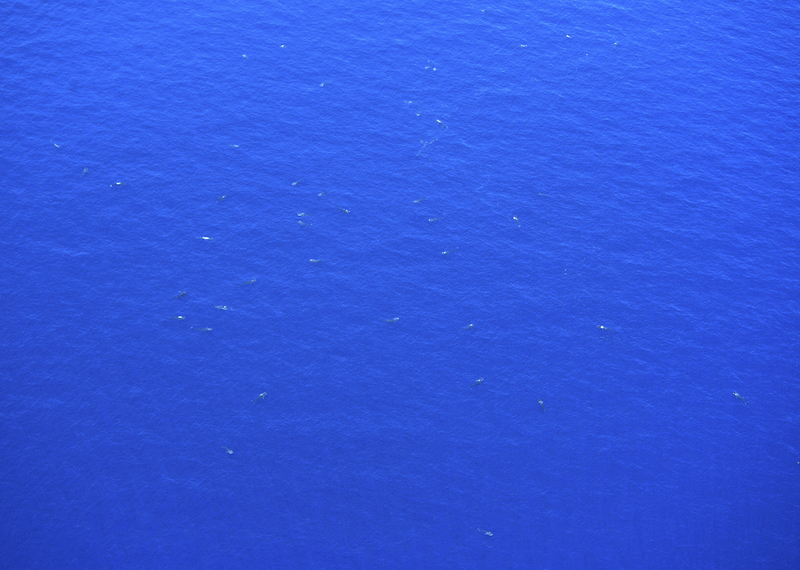 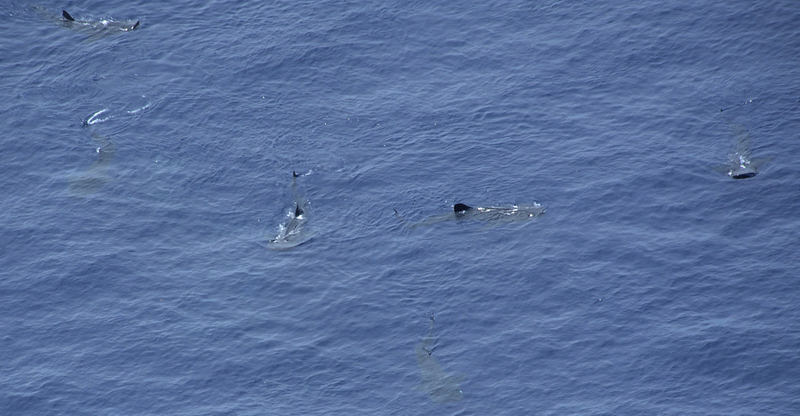 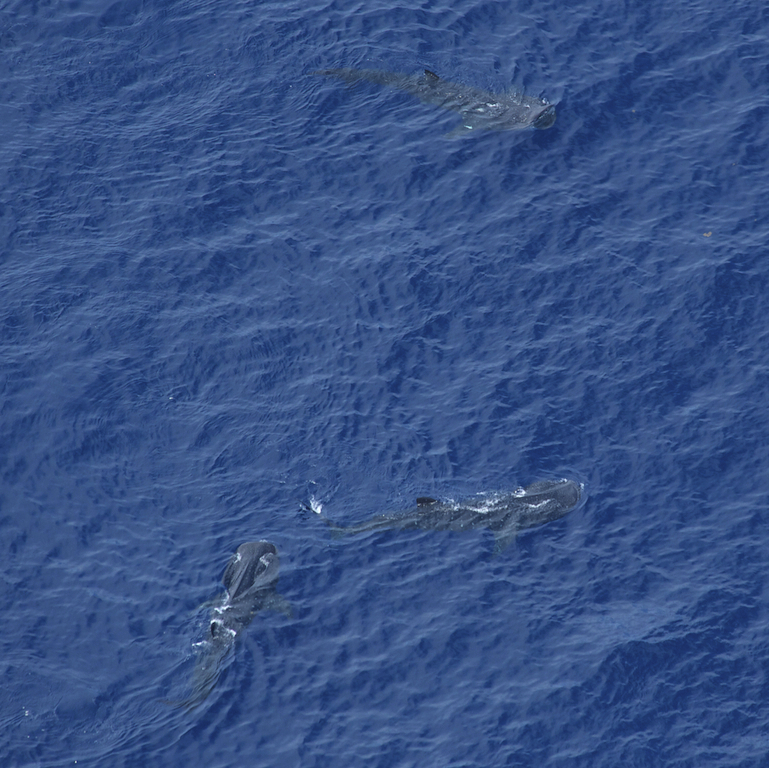 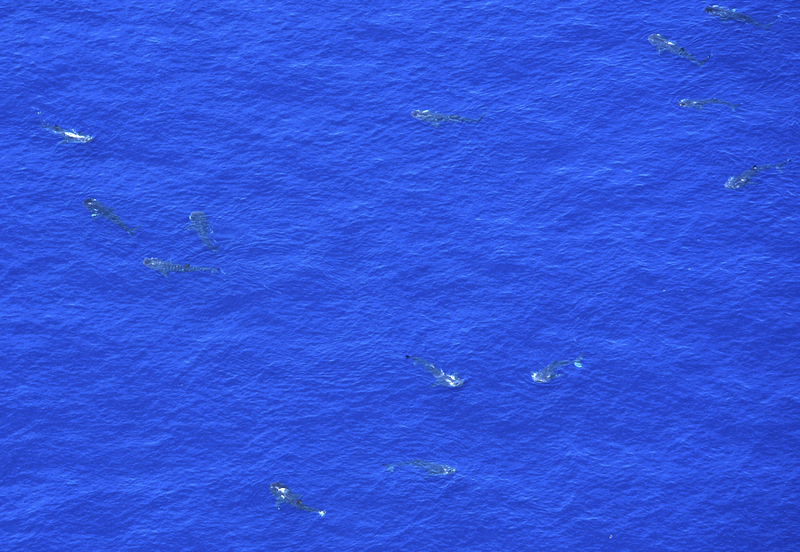 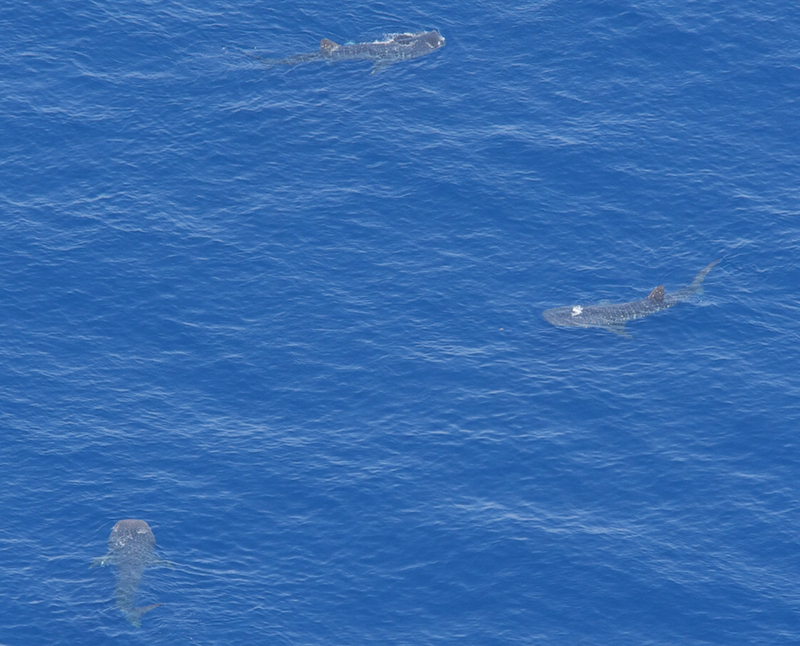 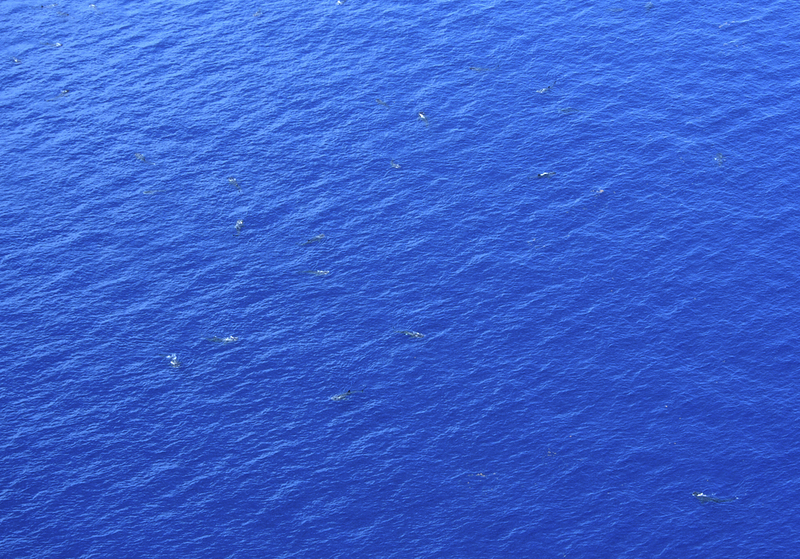 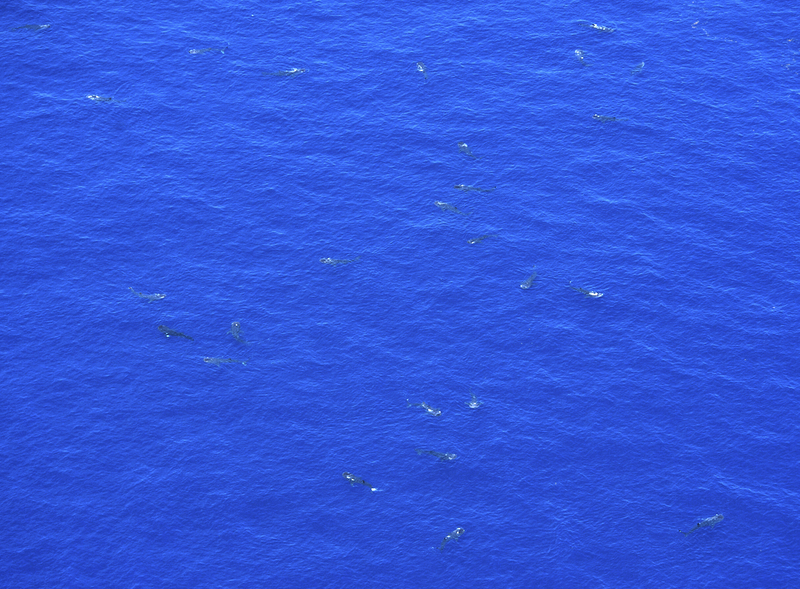 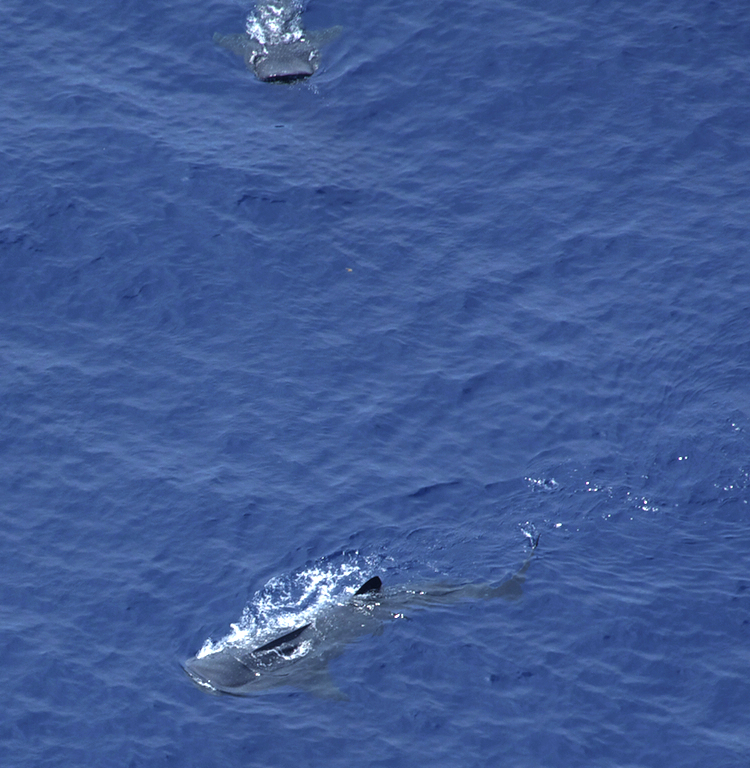 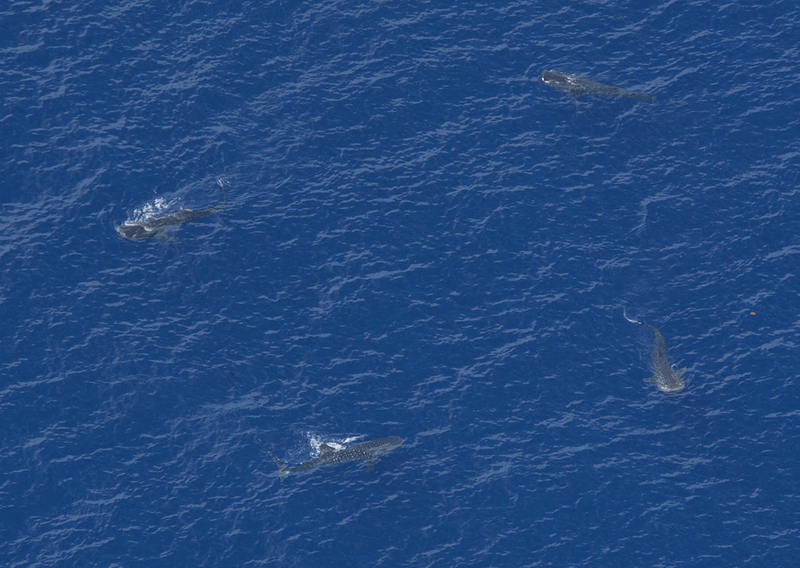 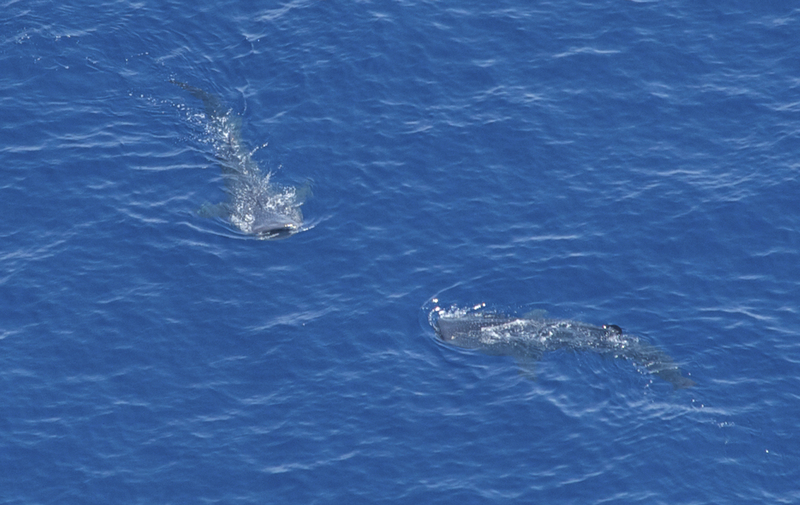 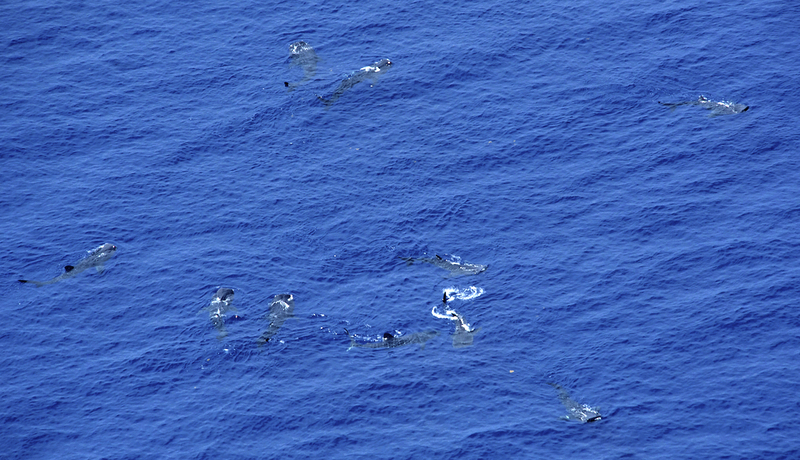 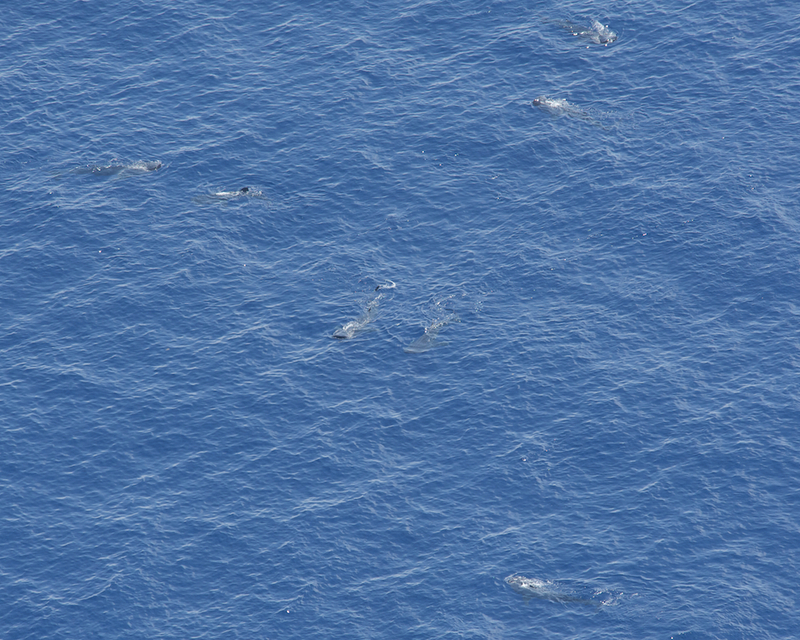 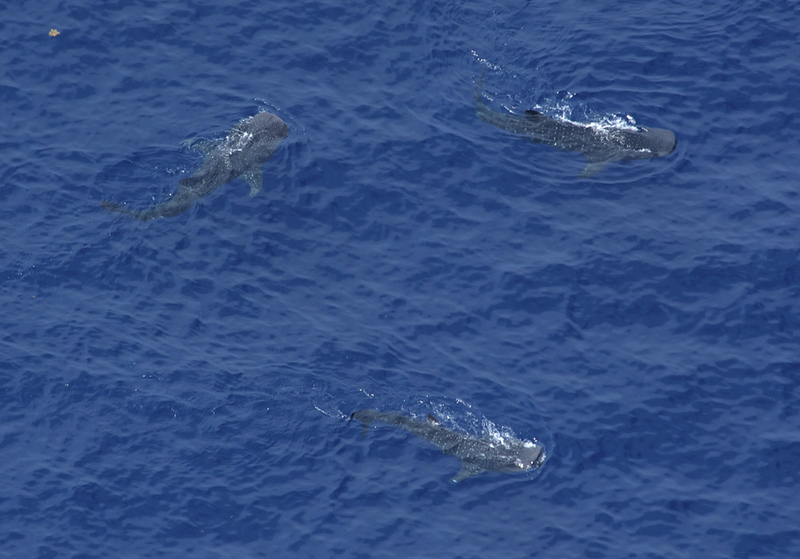 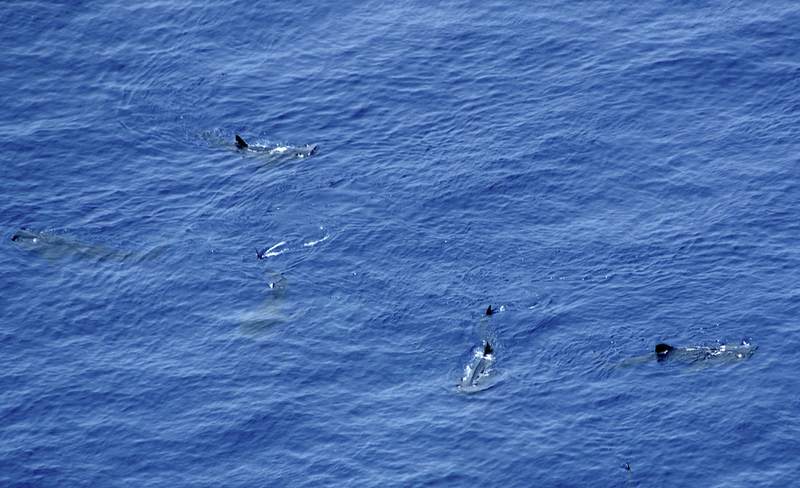 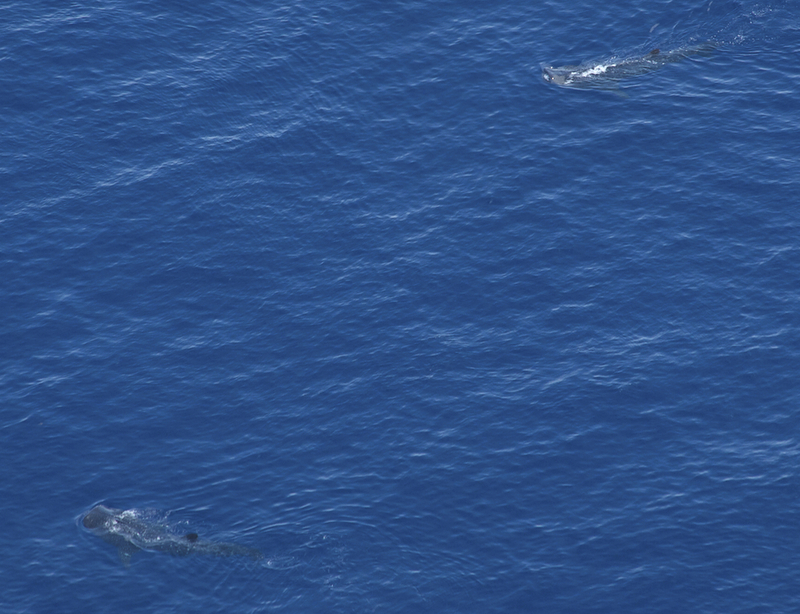 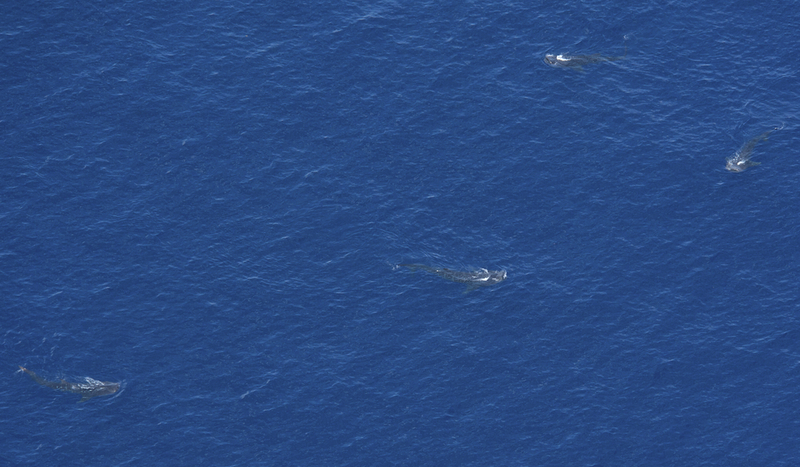 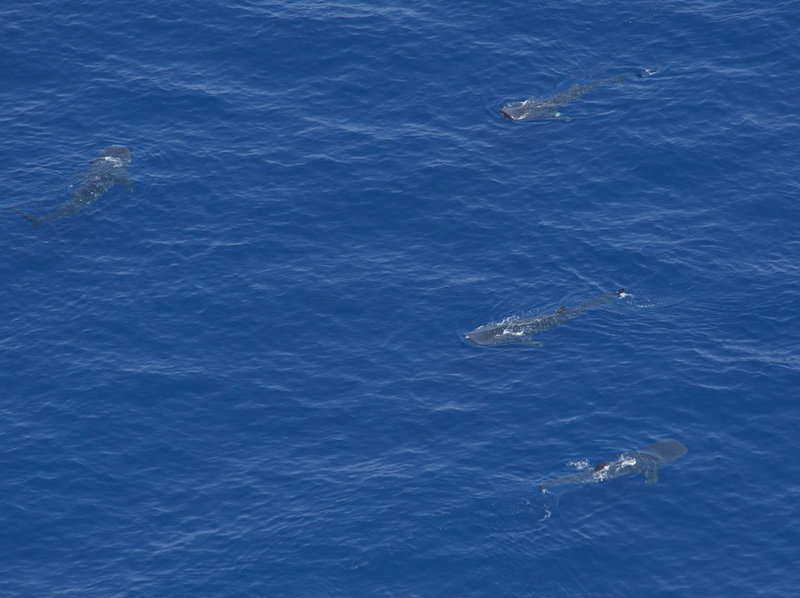 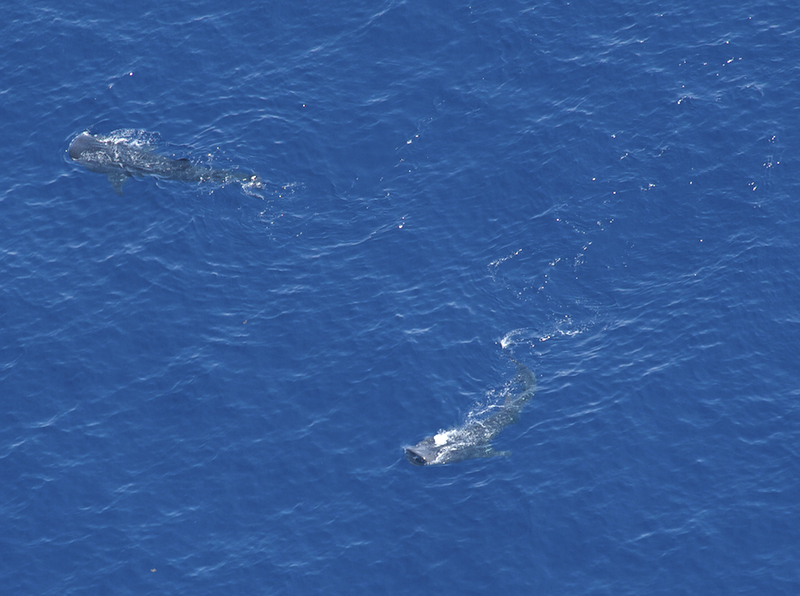 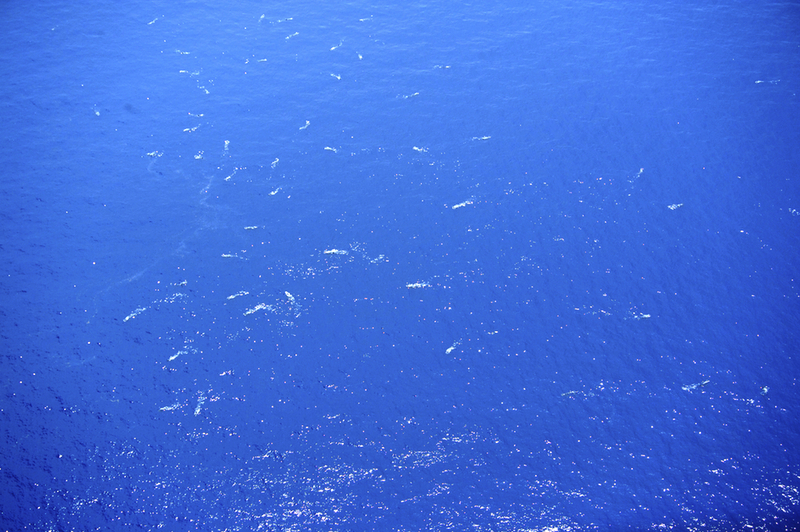 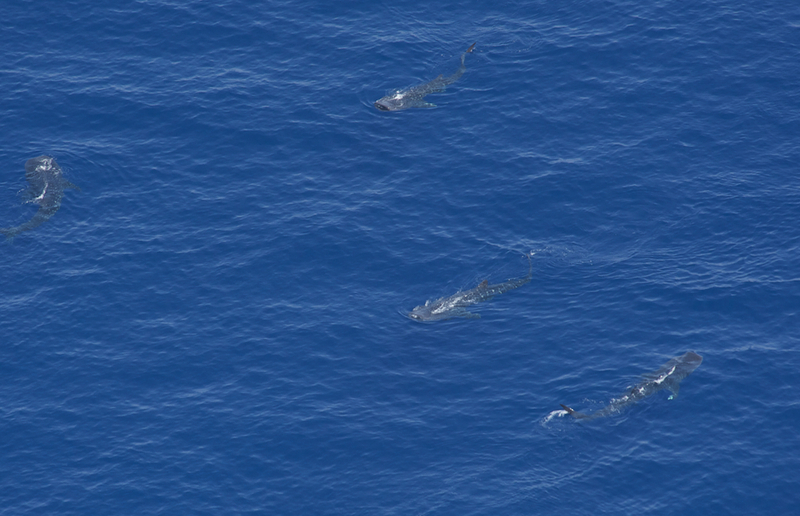 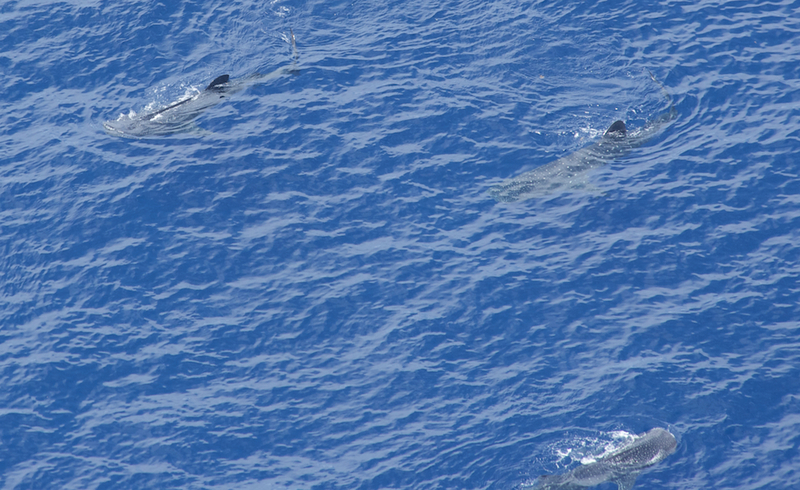 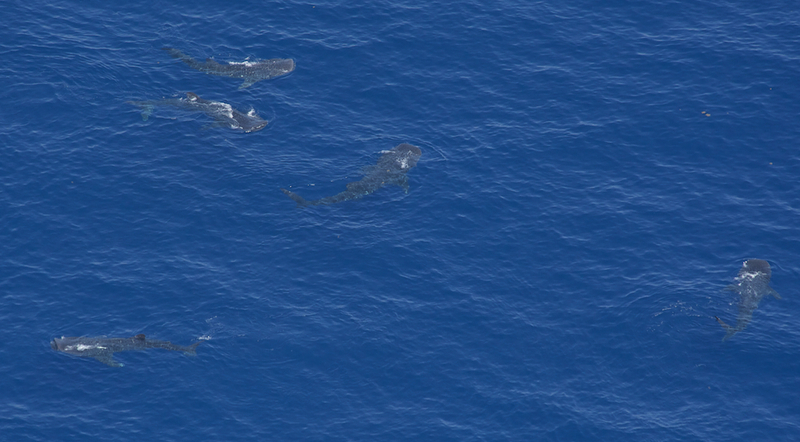 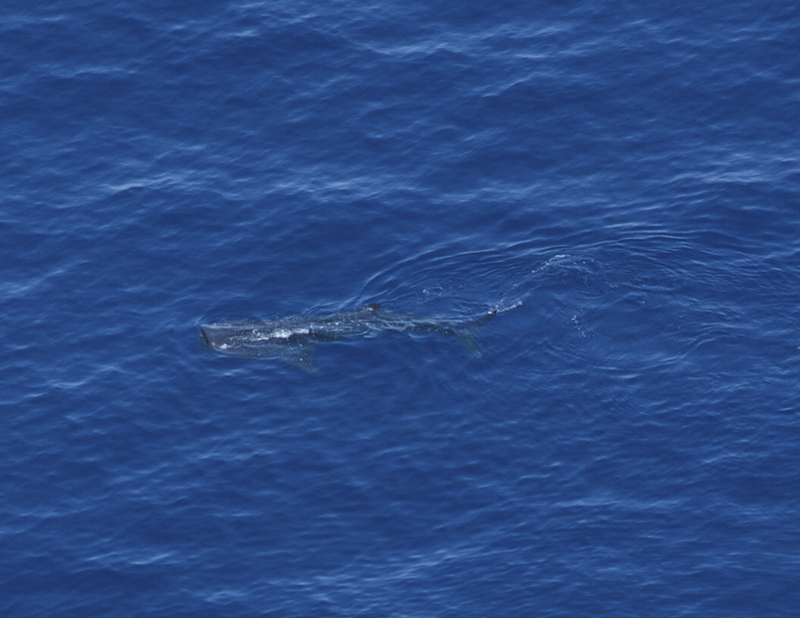 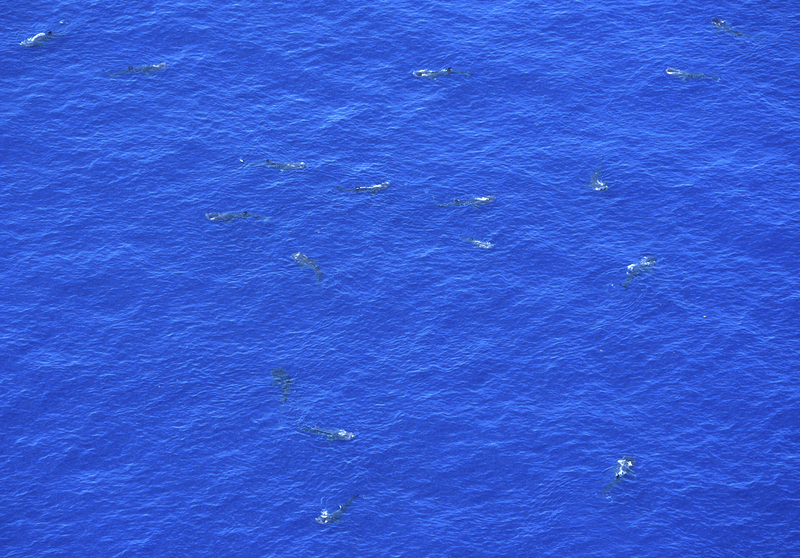 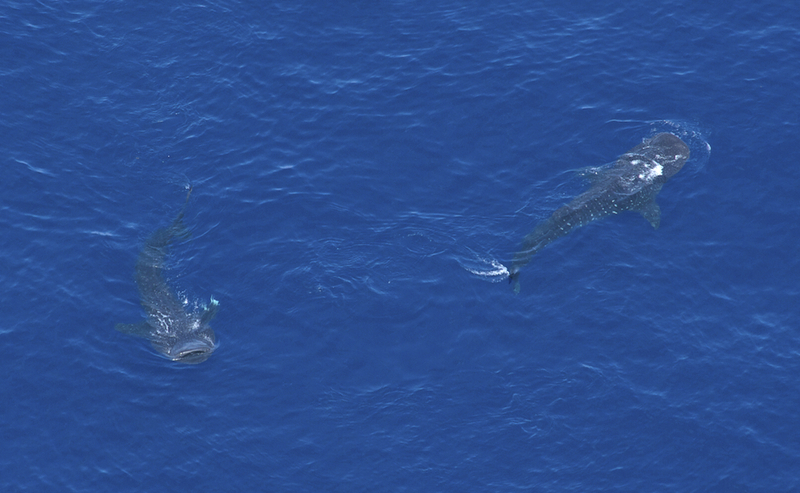 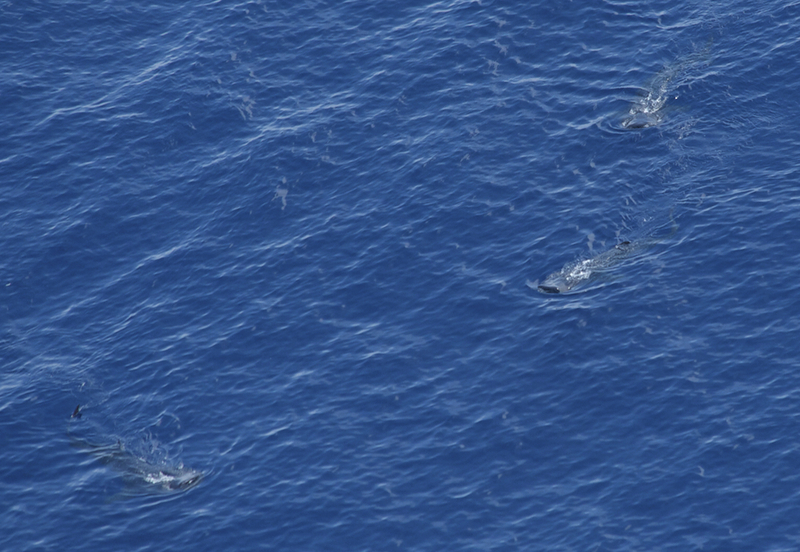 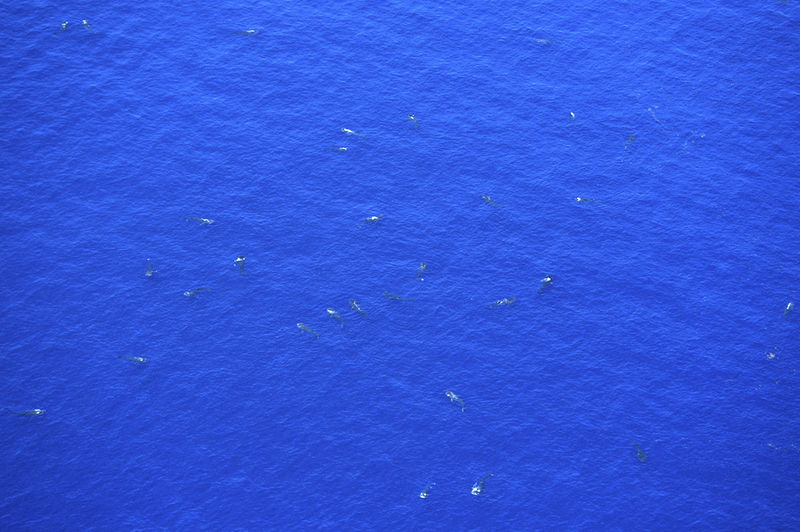 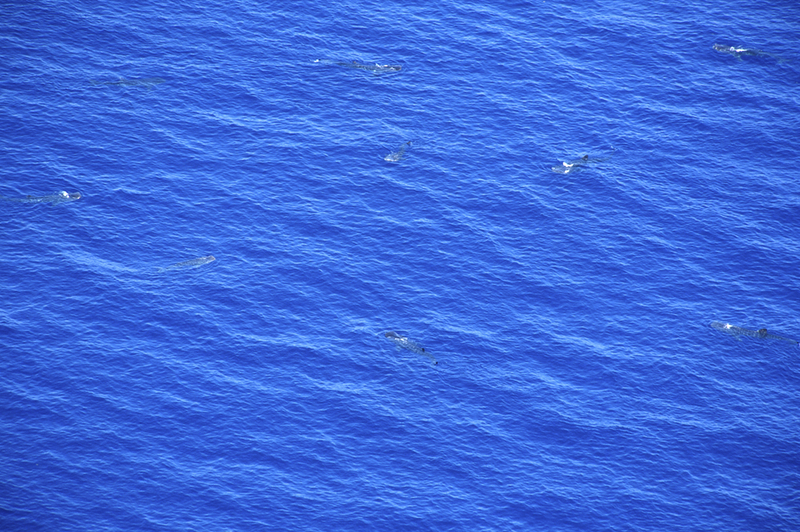 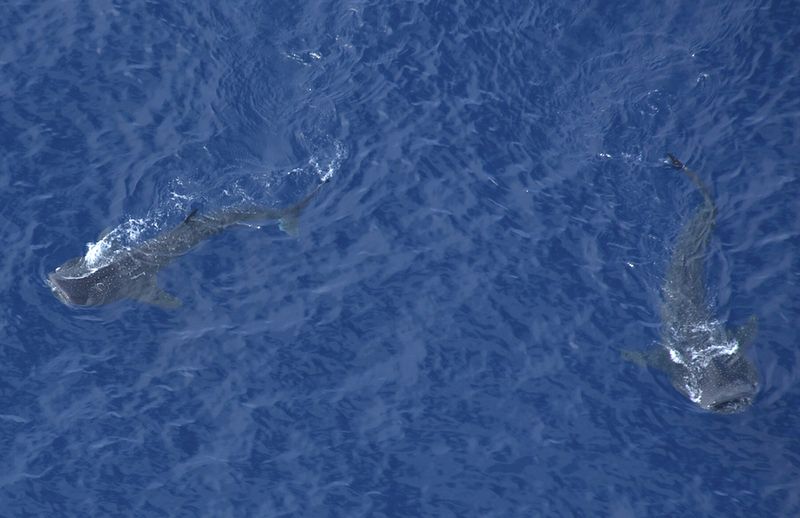 We counted at least 57 whale sharks, all surface feeding together within about one square mile. 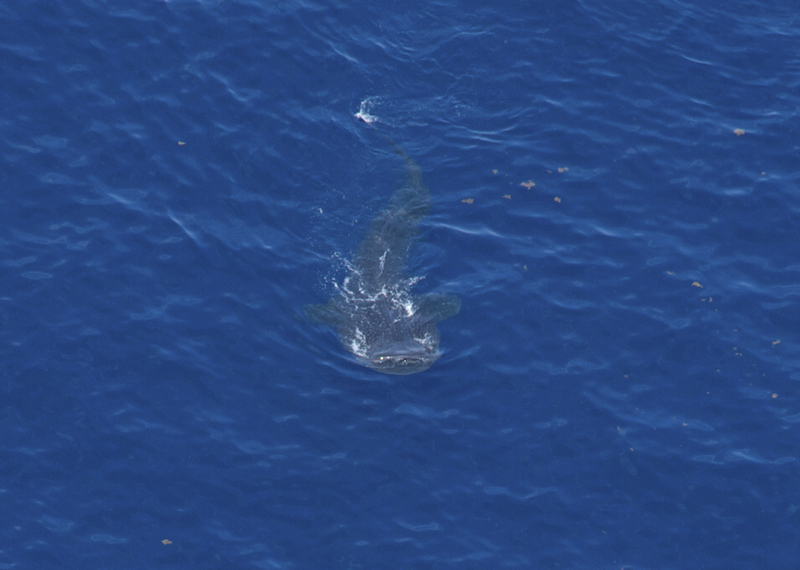 Some looked to be 35-40 ft long, a few only 20-25 ft long. 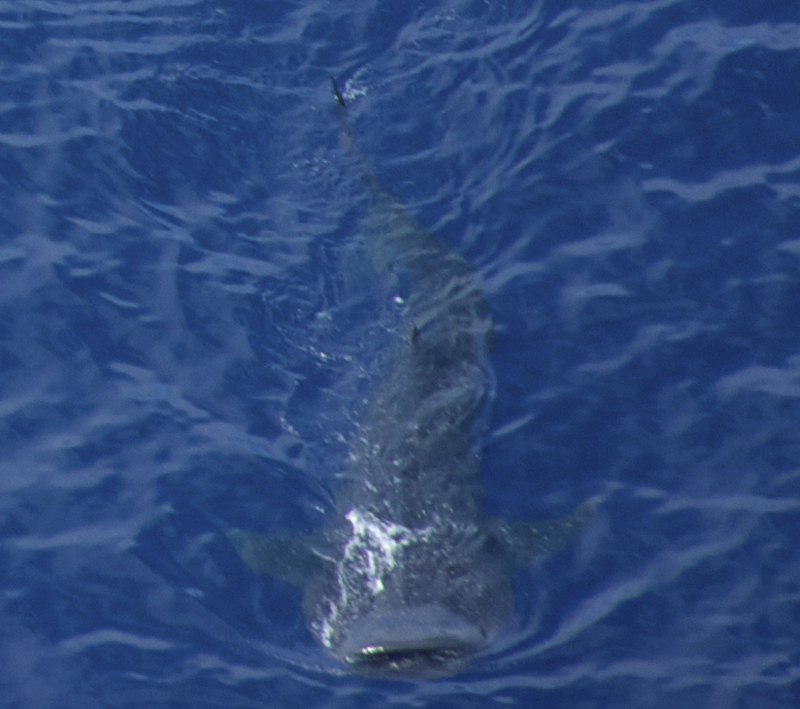 We had no boat with us today, so we can’t know the distribution of gender or maturity among them, unless scientists can make inferences from our high-resolution photos (of which we have many!). 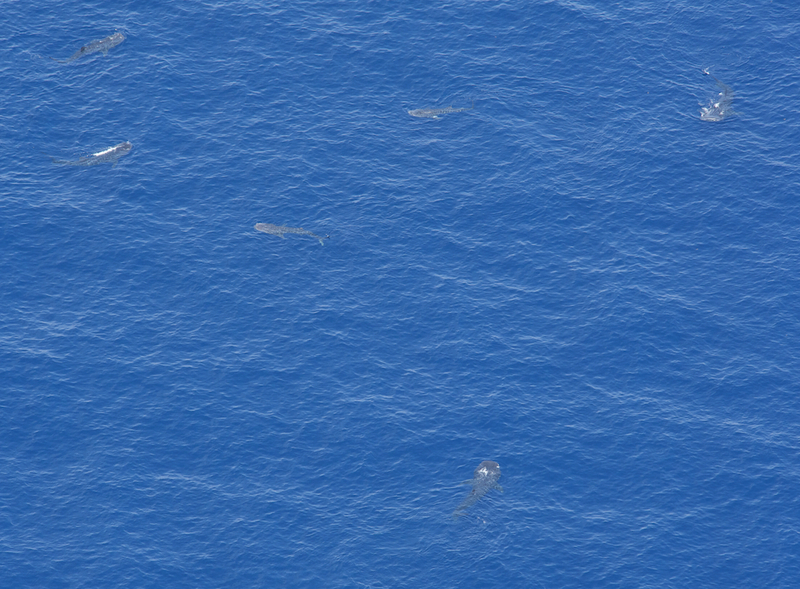 What matters most to us is to realize that these gentle giant plankton feeders are still coming to the Gulf, and in numbers that seem to be growing. 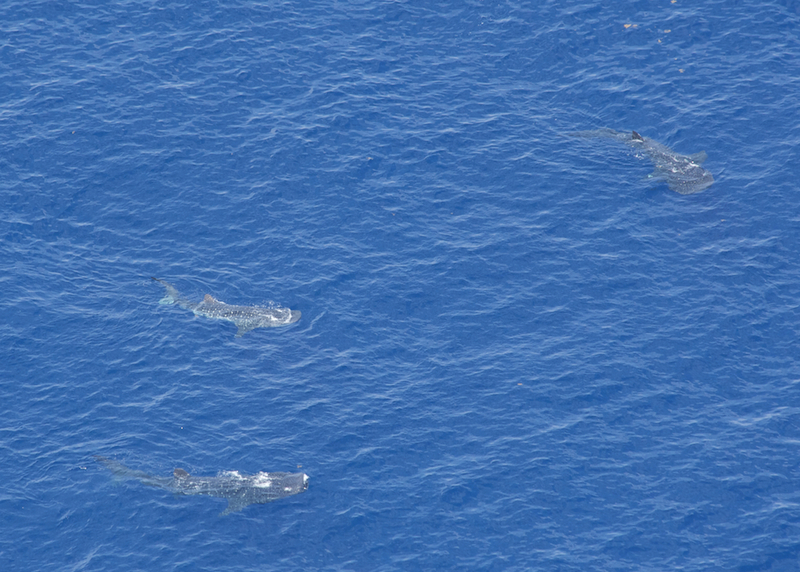 We can’t wait for the day we see hundreds gathered again, as had been found in 2010 and earlier. 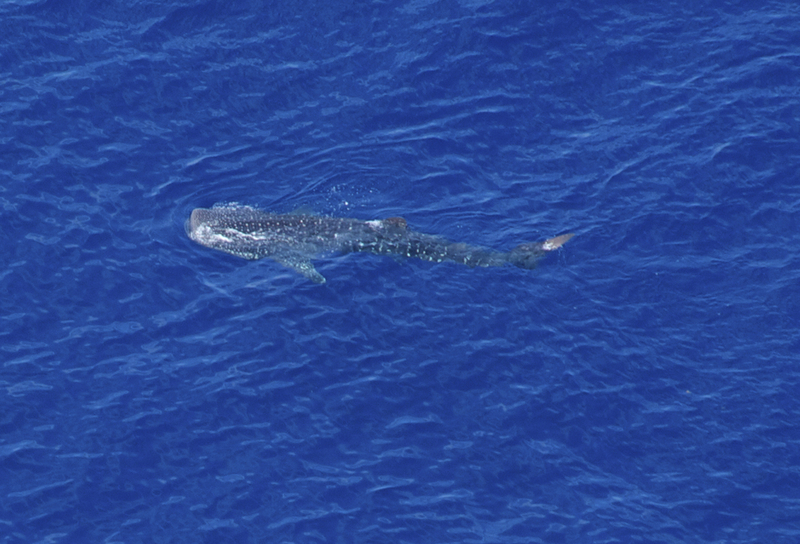 From the ten whale sharks tagged and many more sampled in our successful search last July, much information will be gained over the next year. 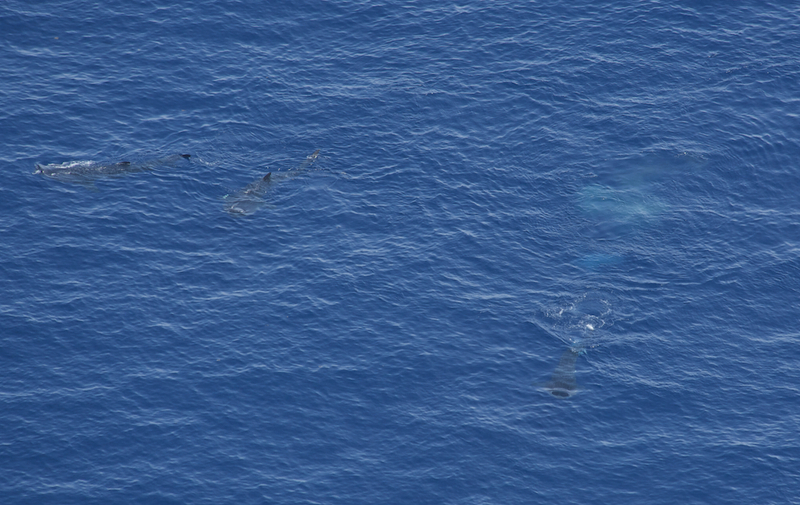 Those tags stay on the animals for several months to a year, gathering information about depth, water temperature, ambient light, etc. 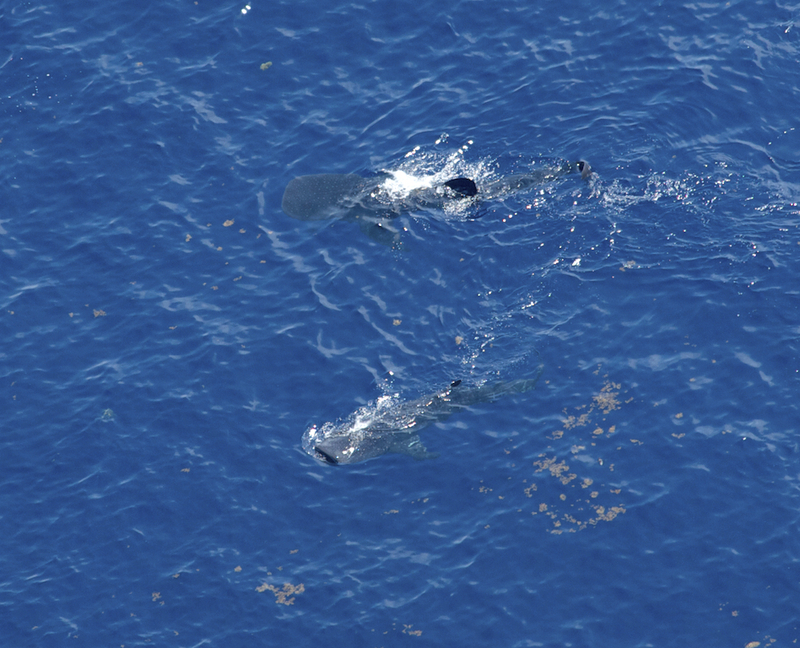 When they pop off, scientists retrieve them and can read the history of the sharks’ diving, feeding, and other habits. 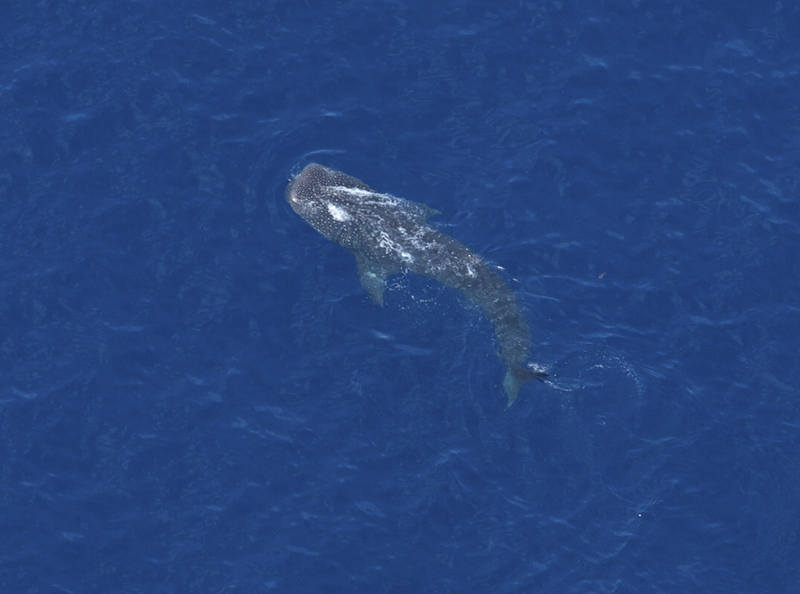 Non-scientifically speaking, of course, we have to say we got a real kick out of seeing something we’re pretty sure has not been seen by many from the air before. 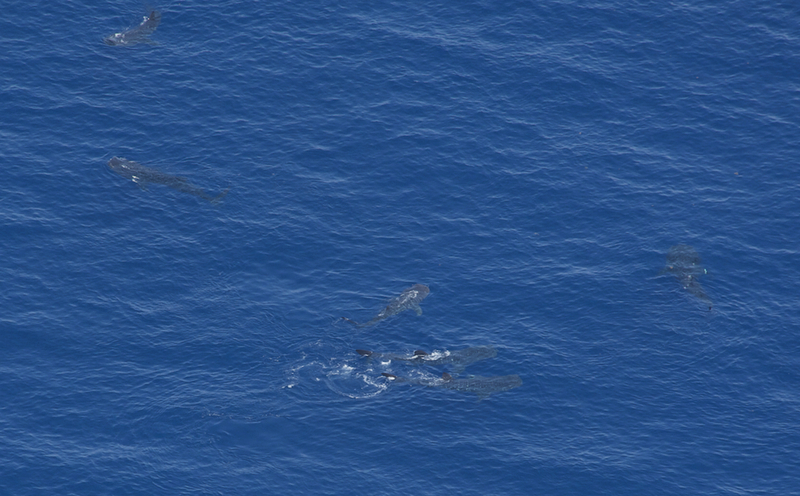 Uh, to put it simply, we watched the sharks start to disperse around an individual member of the group, and then there was a large white swoooosh in the water that was as long and large as several whale sharks. 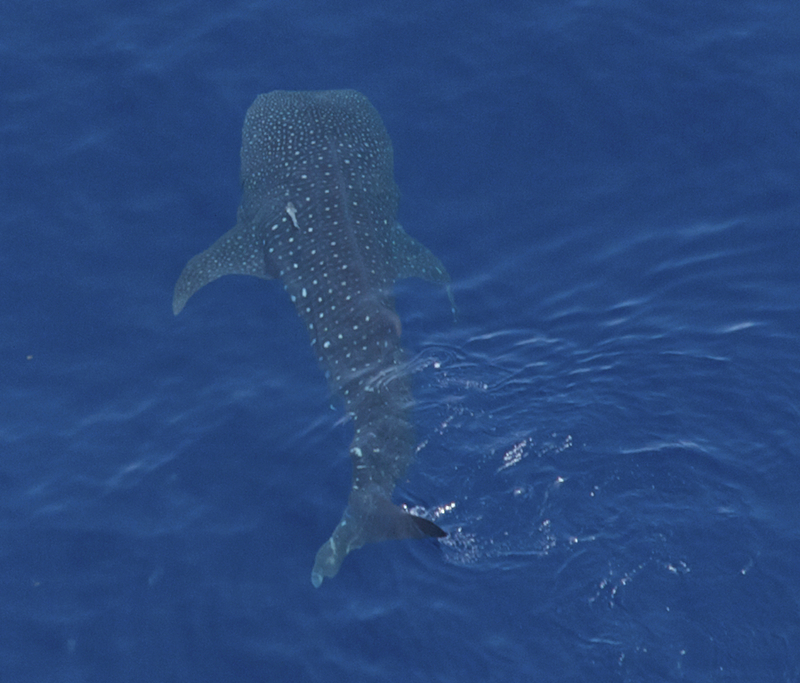 Then came a technical discussion among us of what color whale shark excrement is. 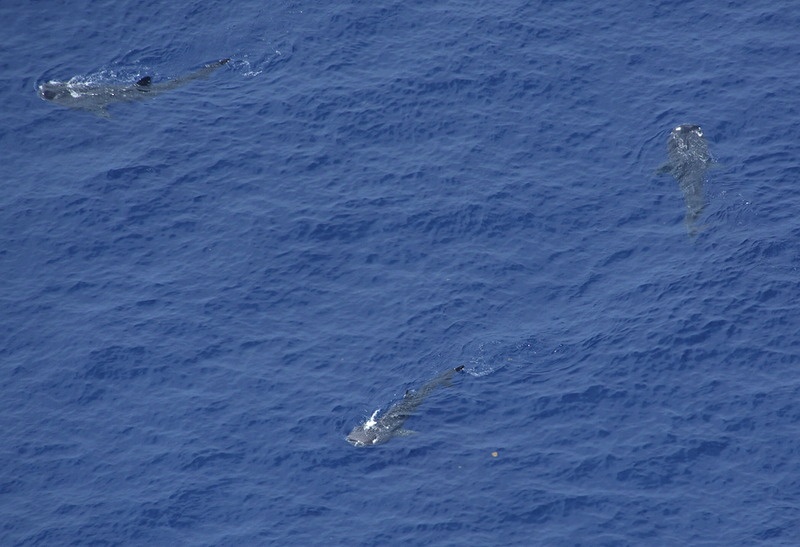 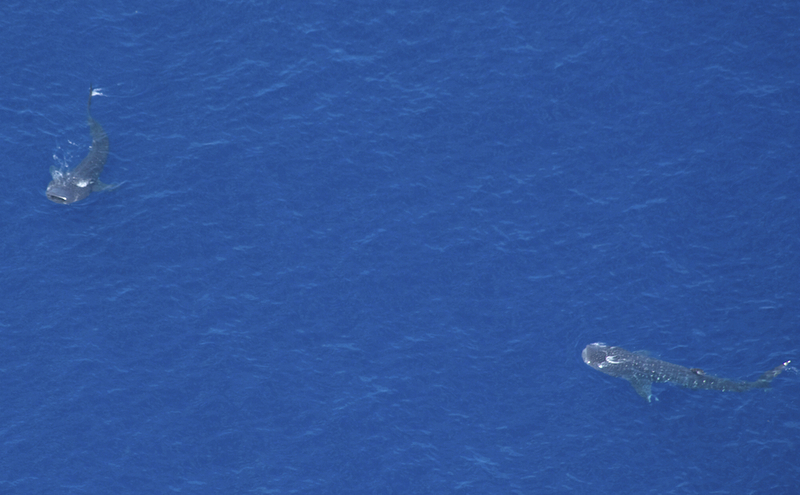 I volunteered that I have seen humpback whale poop often, and it is brownish in color. 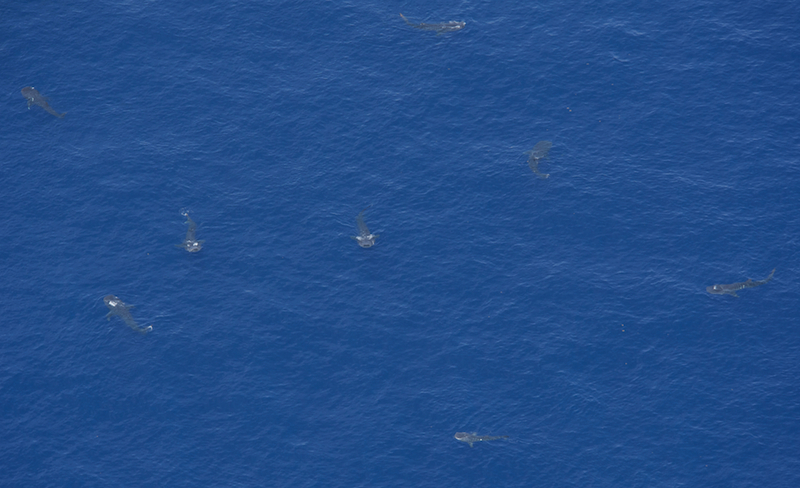 So the question was raised whether this could be eggs or sperm, but then we remembered that sharks mate, and the females give birth to live young. 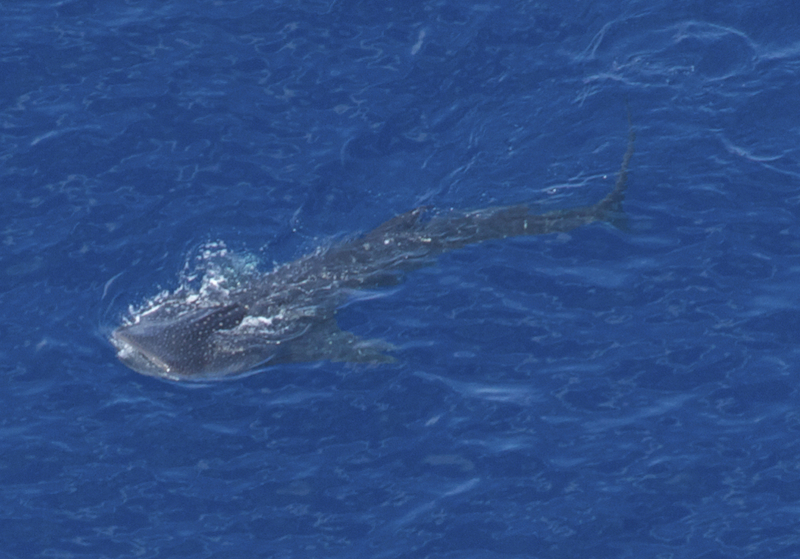 We finally concluded that whale shark poop must be whitish in color. 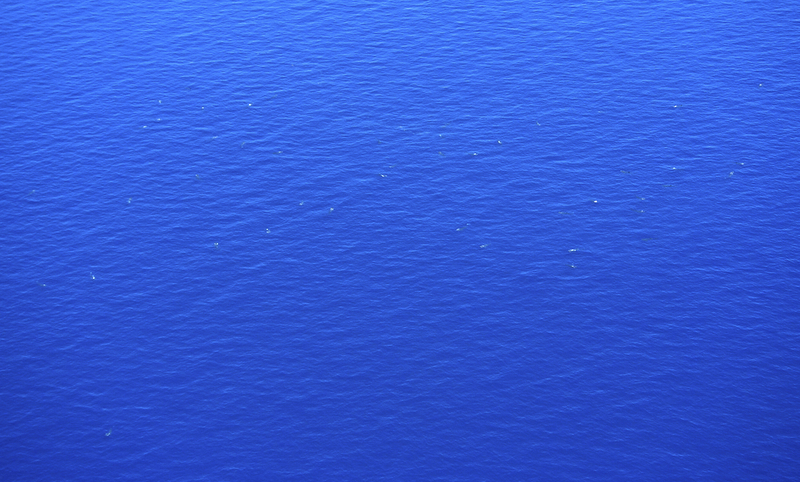 Anybody out there an expert on this? The photos and videos of it don’t capture the drama it held for us at the time, as we saw one individual animal become somewhat isolated from the others and then, er, let loose. 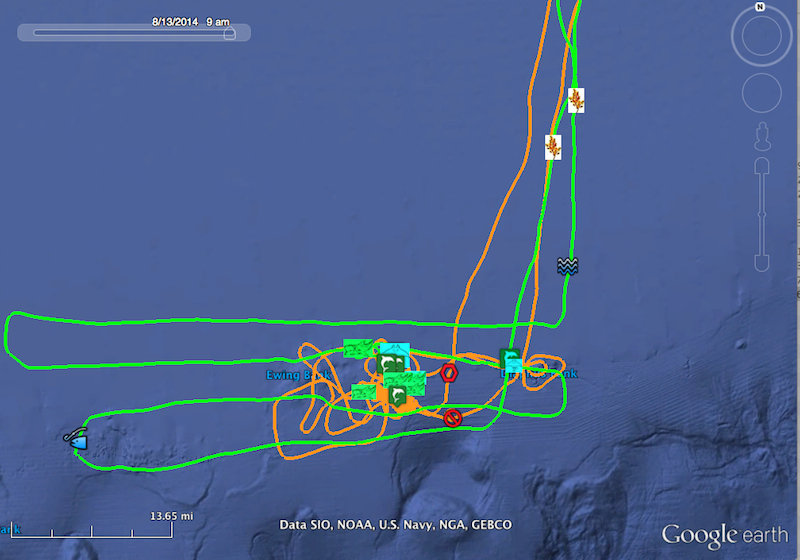 Maybe flying low and slow over the ocean does something to one’s brain, but at the time we thought it was pretty darned interesting. 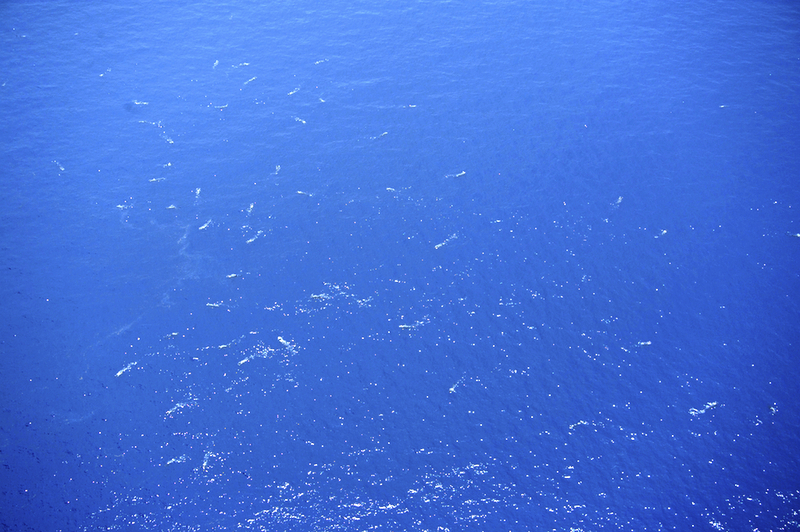 Here are a few of our favorite photos, with lots more in the galleries below as well as a video, and of course our flight log with more details at the end of this article. 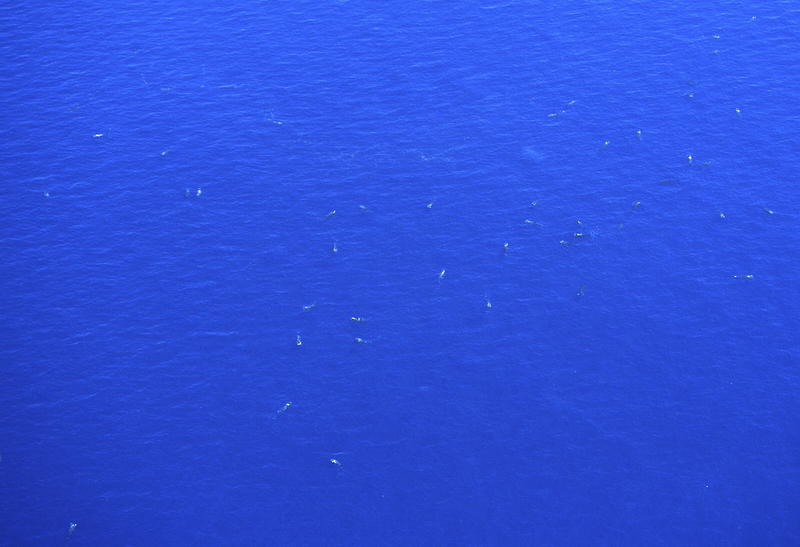 We’ve separated them into photos of single whale sharks, pairs, groups of three to eight, groups of nine to 20, and finally larger aggregations. 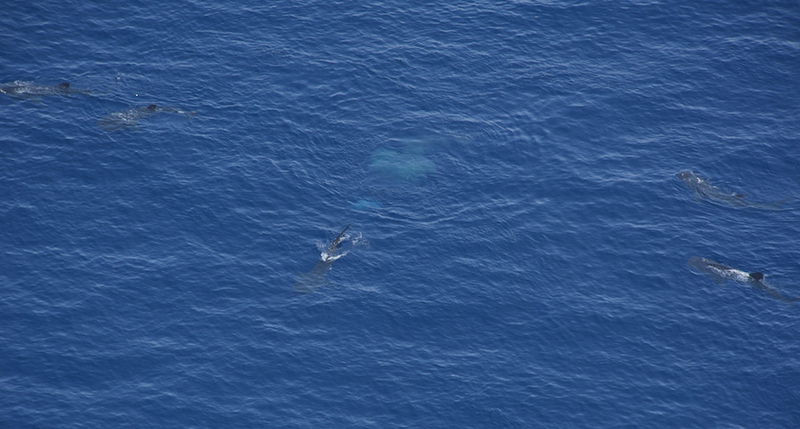 A separate article for today’s flight will be posted later, showing you all of the other animals and sights we saw today. 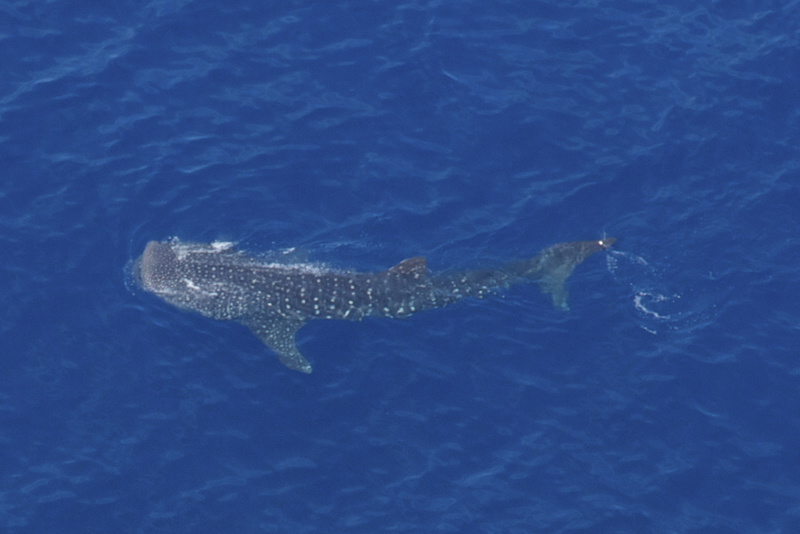 But in consideration of International Whale Shark Day on August 30, this article is dedicated to whale sharks alone! 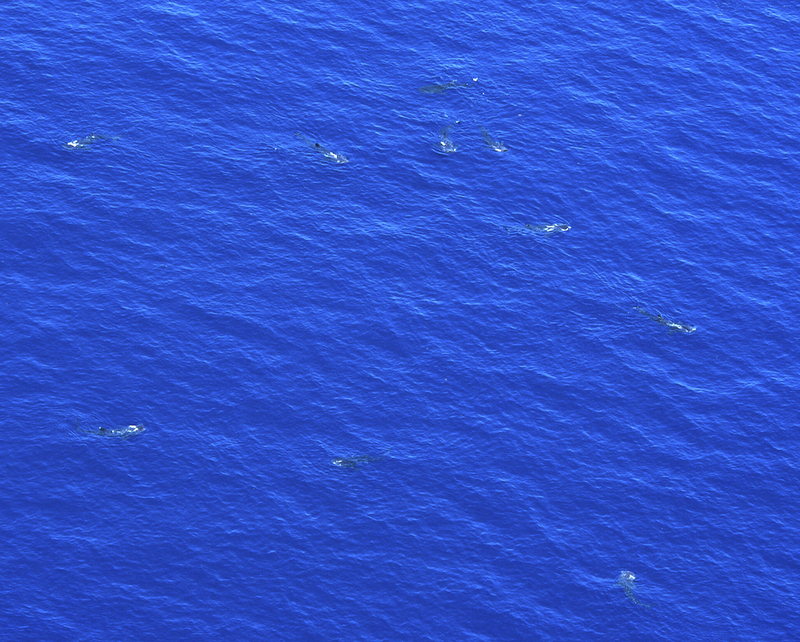 Our greatest thanks goes to our On Wings Of Care volunteers and supporters who make it possible for us to share all of this with you, which we do in the deepest hope that you will join us in doing all you can to protect and preserve the Gulf of Mexico and all of her wildlife, and all marine life worldwide. 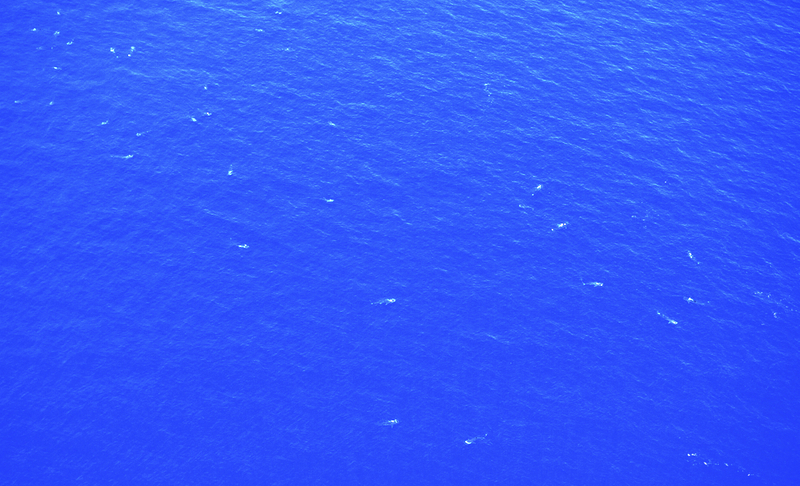 Today’s tireless spotters and photographers included Terese P. Collins and Billy L. Dugger of Biloxi, MS. And as always, we have the folks at Flightline First at Lakefront Airport to thank for giving us discounted fuel for these trips and a wonderfully convenient and safe place to keep our aircraft. 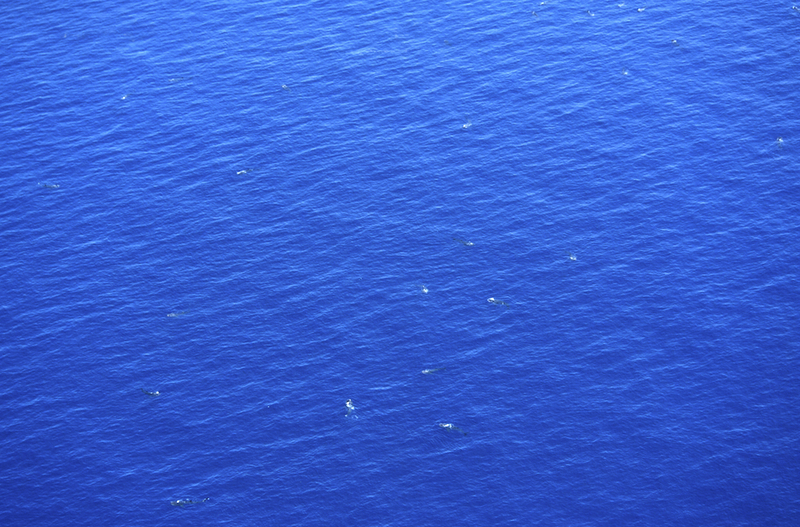 THANK YOU, ALL! 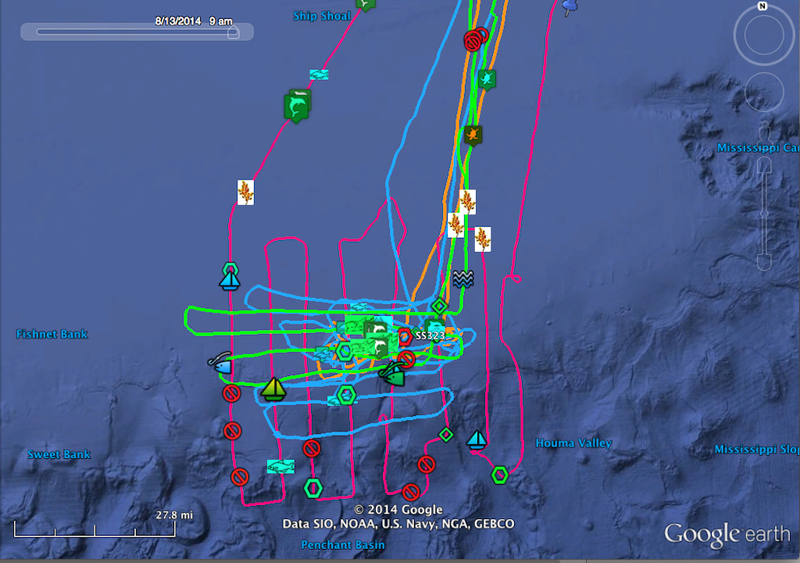 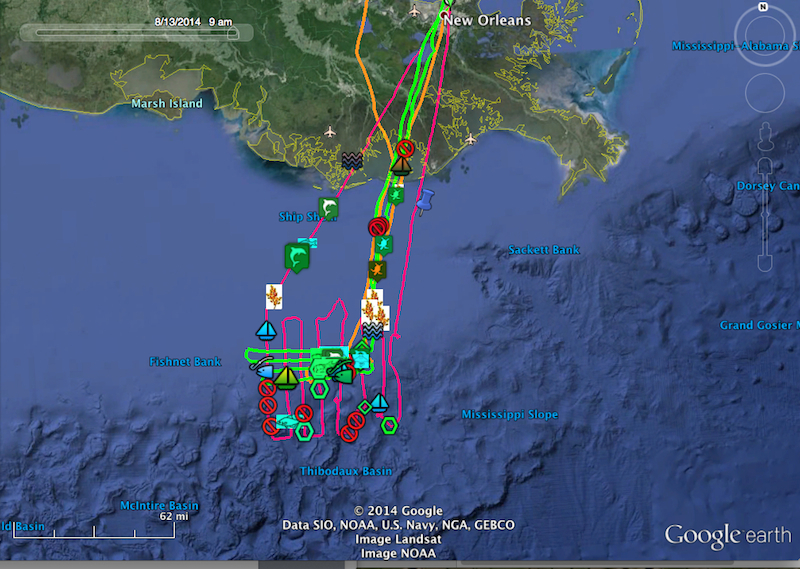 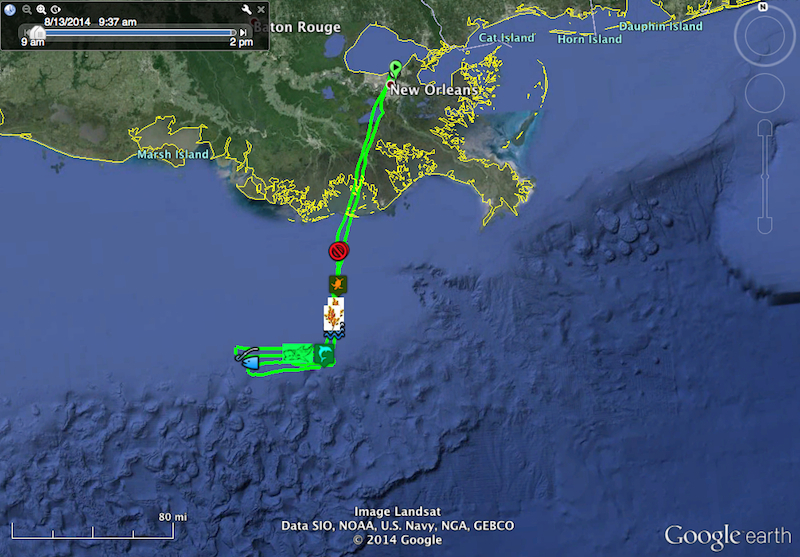 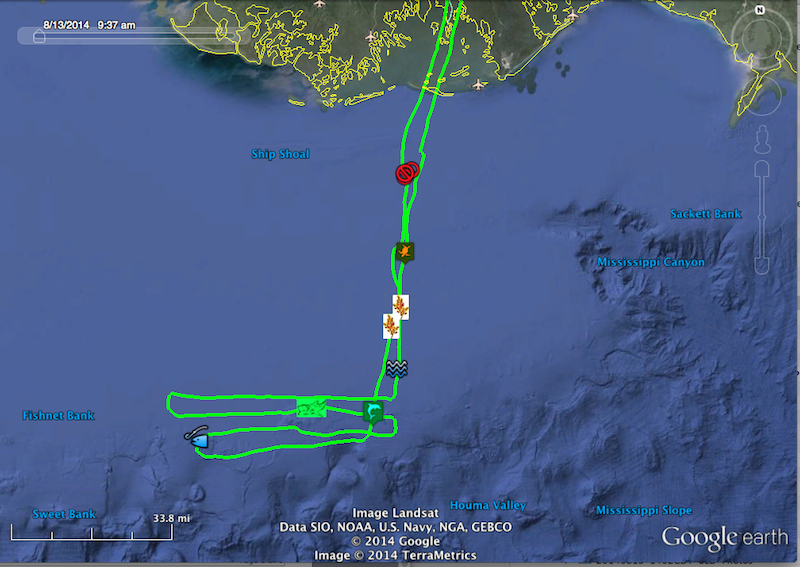 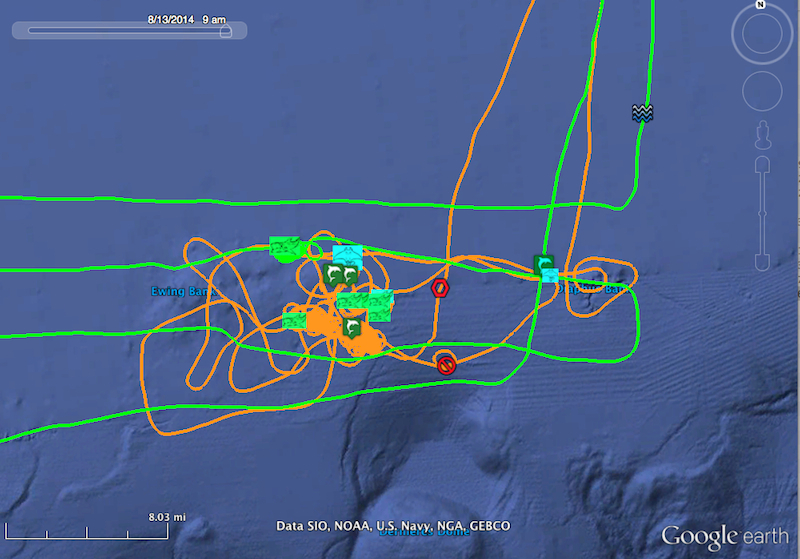 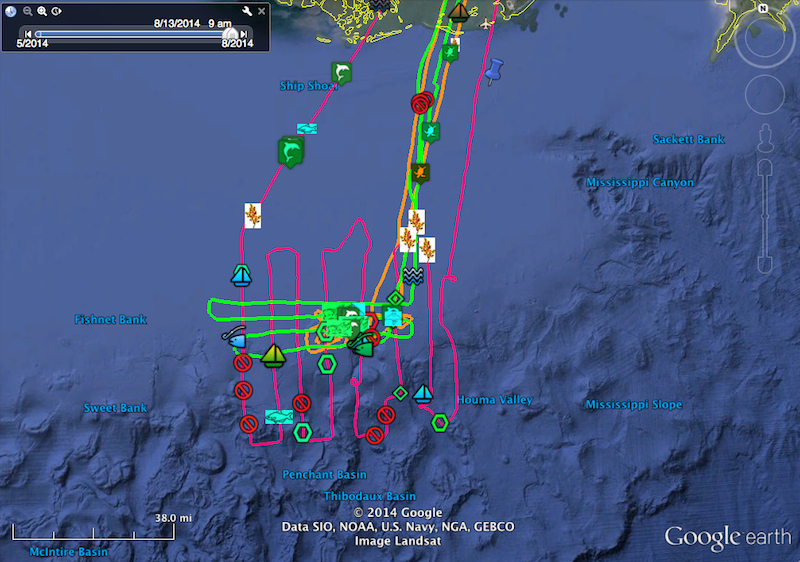 Here are maps showing where we found them, and our flight paths. 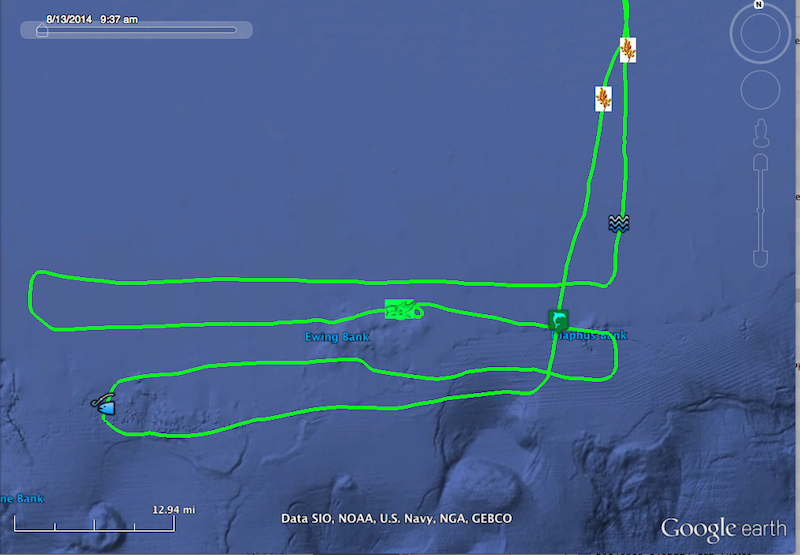 The green paths are today’s flight — which as you can see, stayed pretty much where we found them, except for a brief survey farther south afterward. 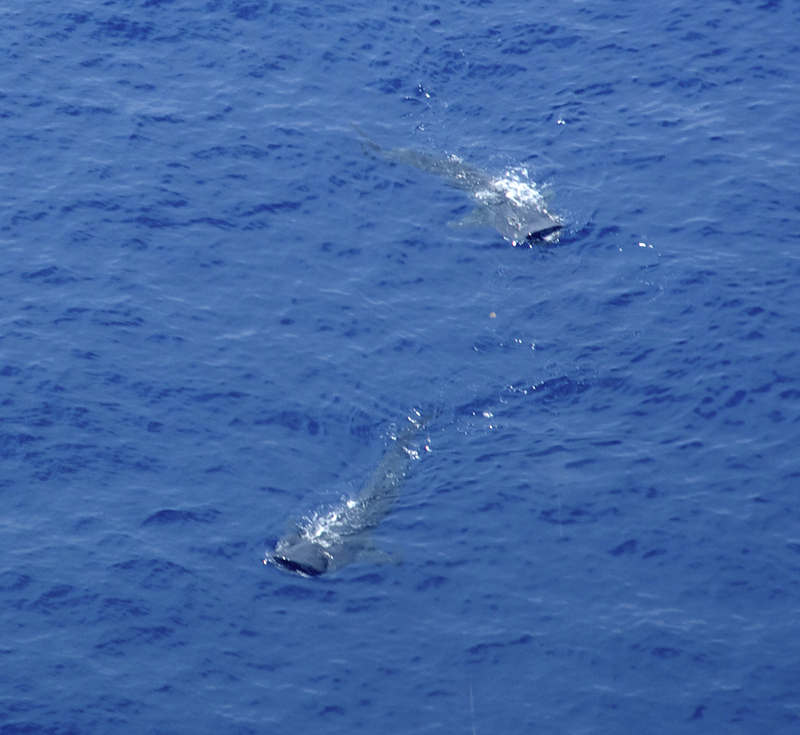 The magenta-colored flight path was our first survey of 2014 in the Ewing Bank area, from May 22 (see that article here). 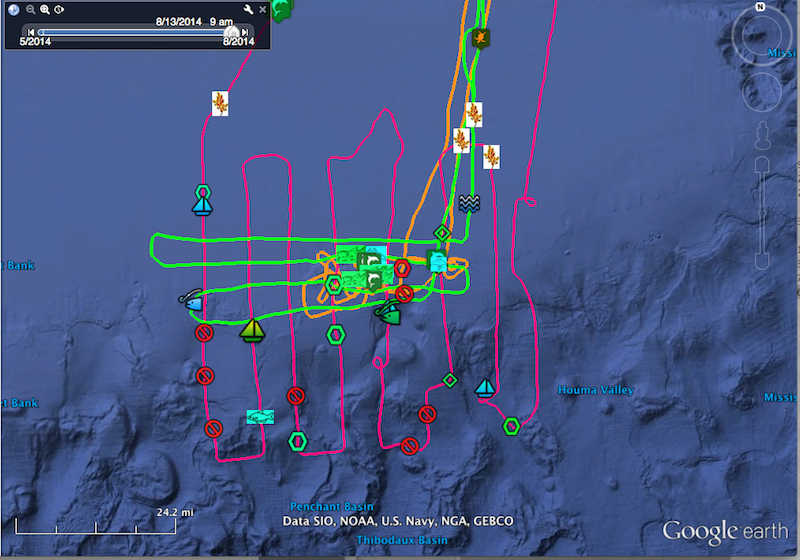 The blue route was our second trip to Ewing Bank on June 12 (see that article here). 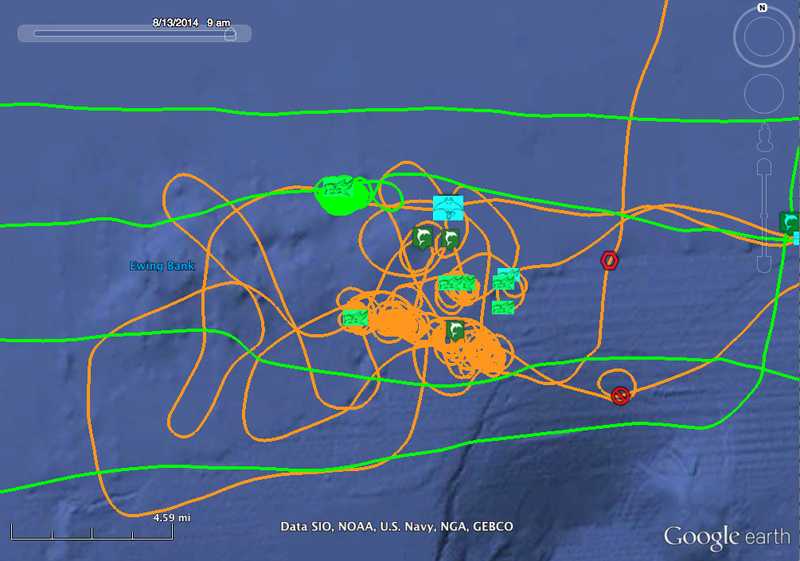 The orange route is the last spectacular tagging trip to Ewing Bank on July 10, where ten animals received tags that should stay on for up to a year (see that article here). 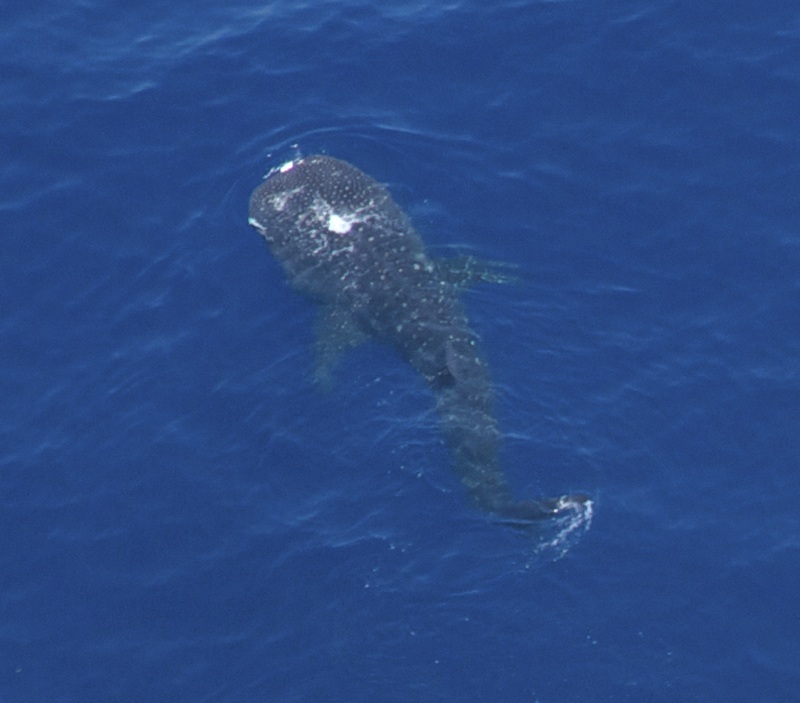 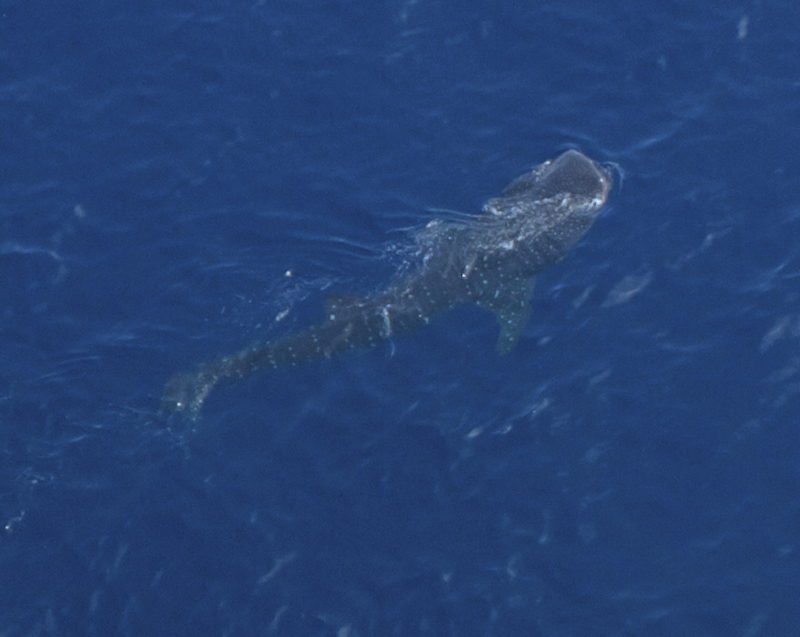 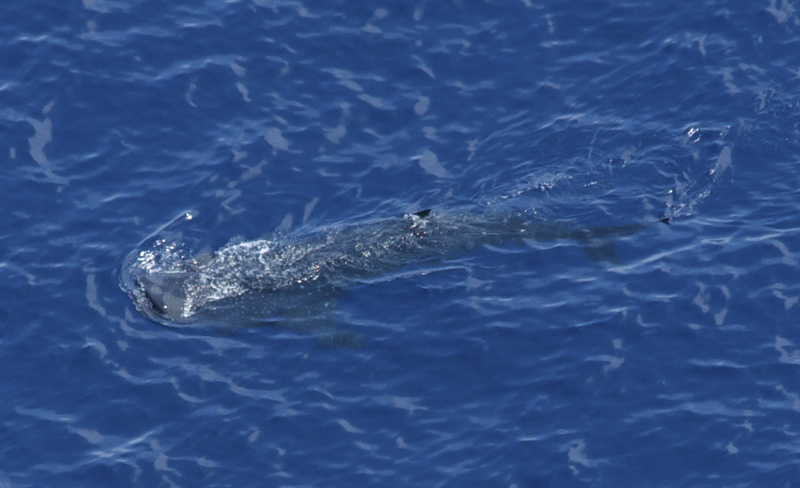 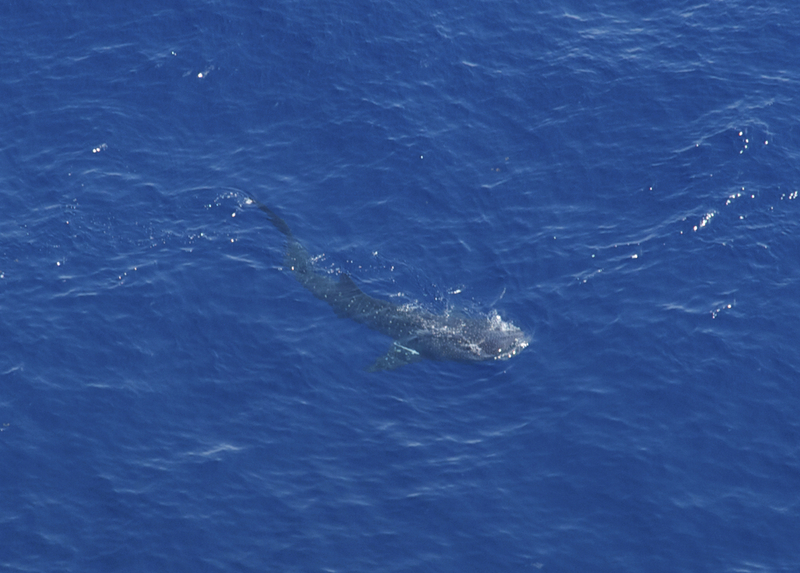 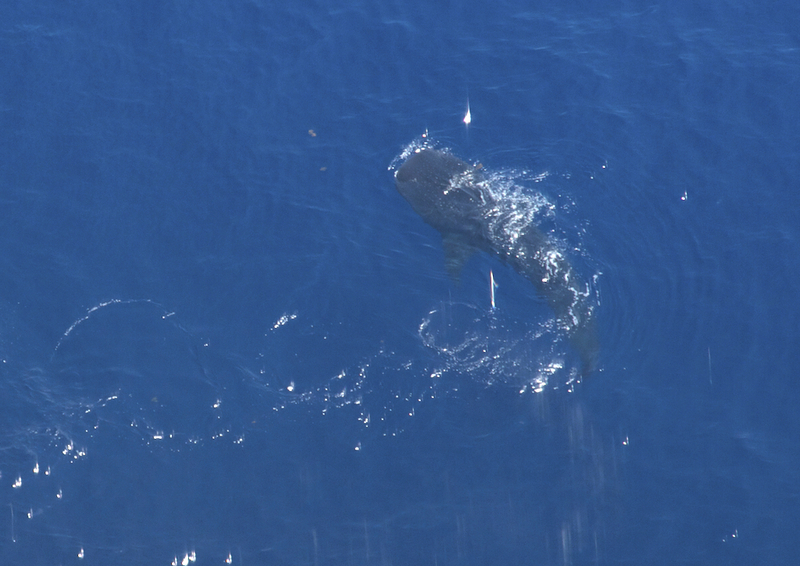 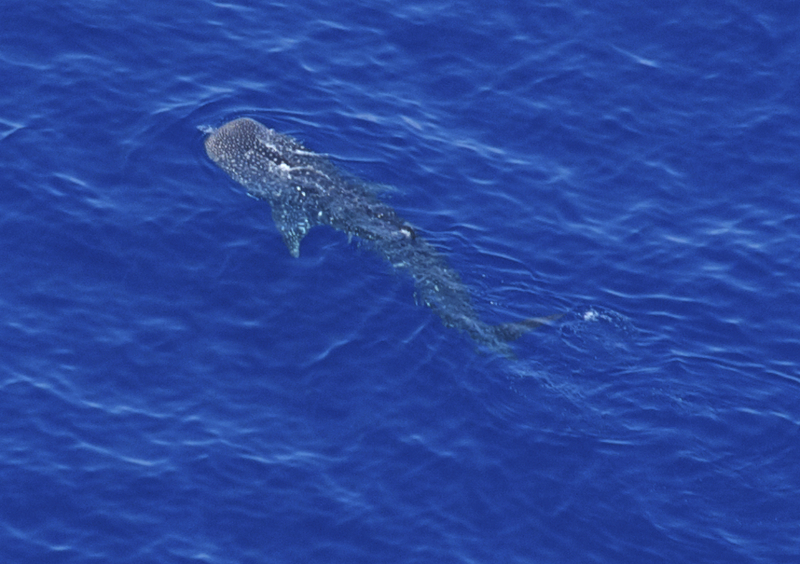 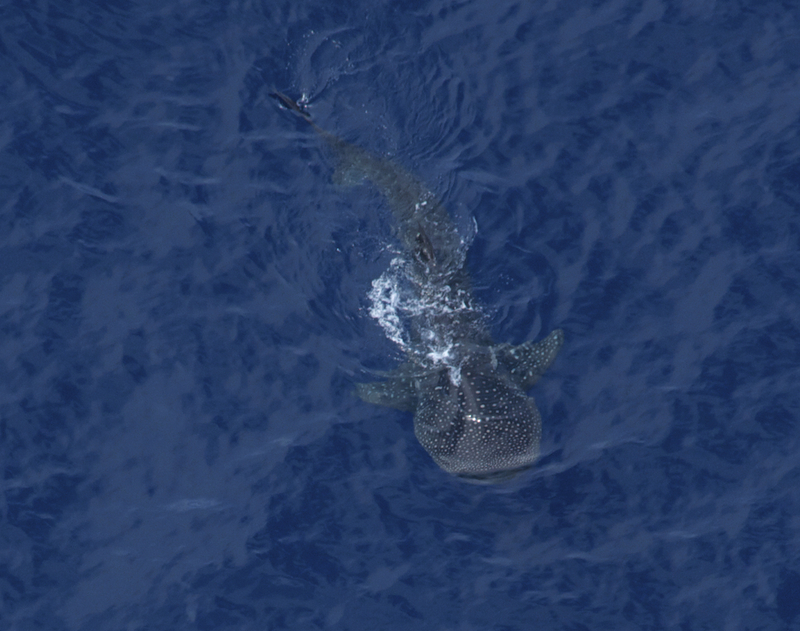 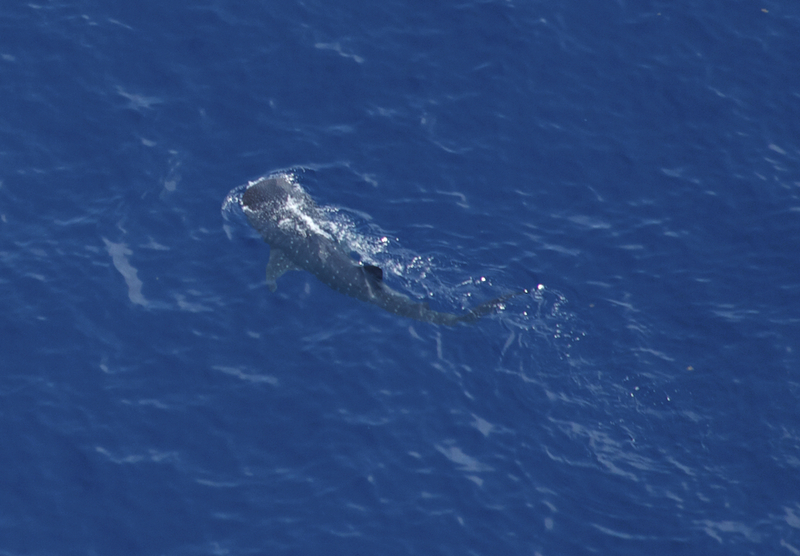 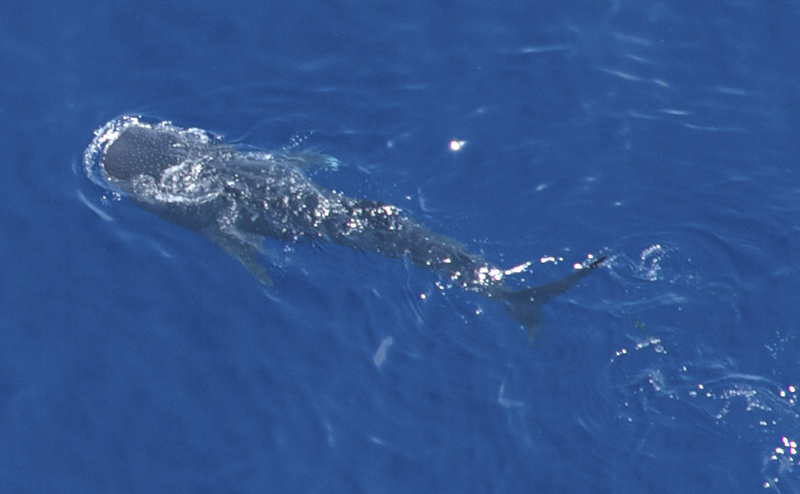 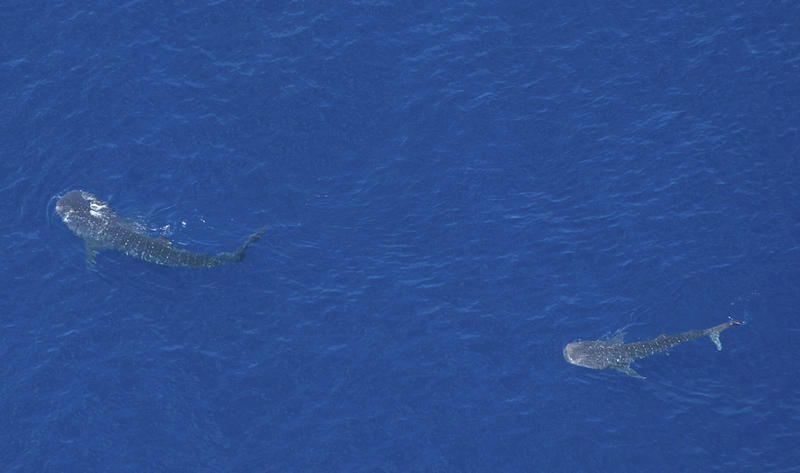 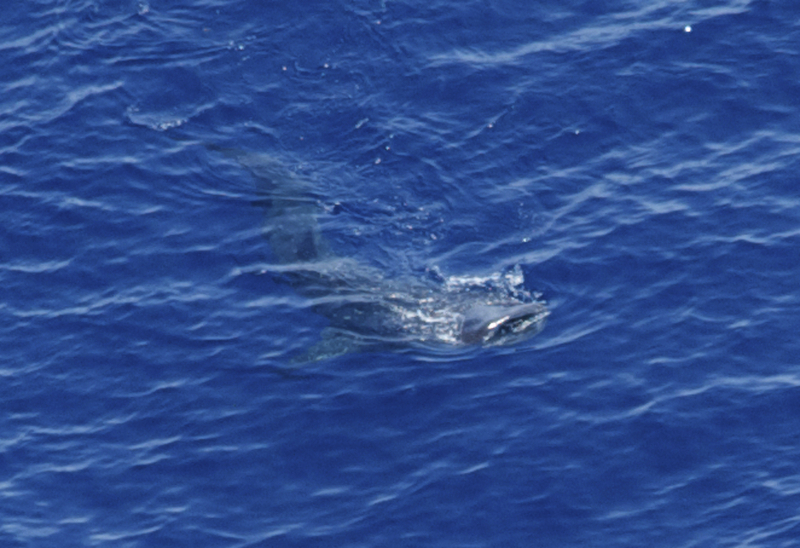 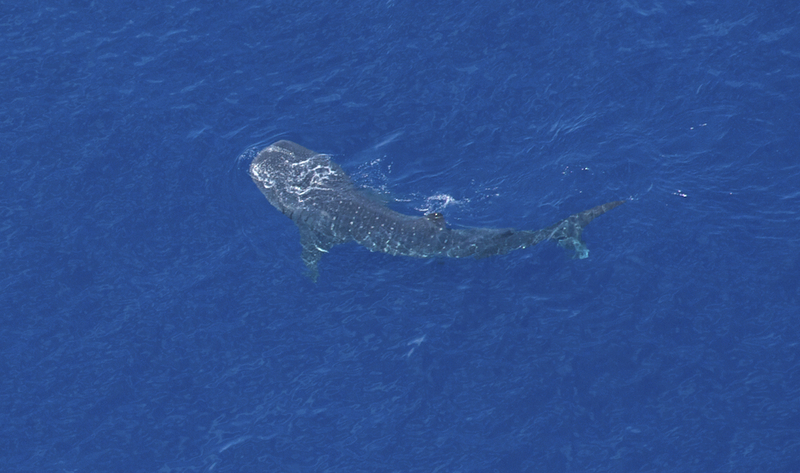 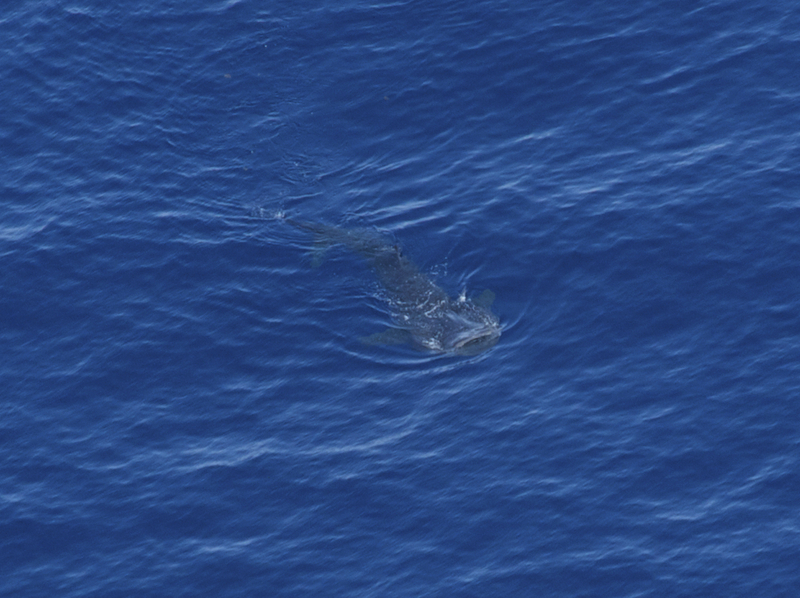 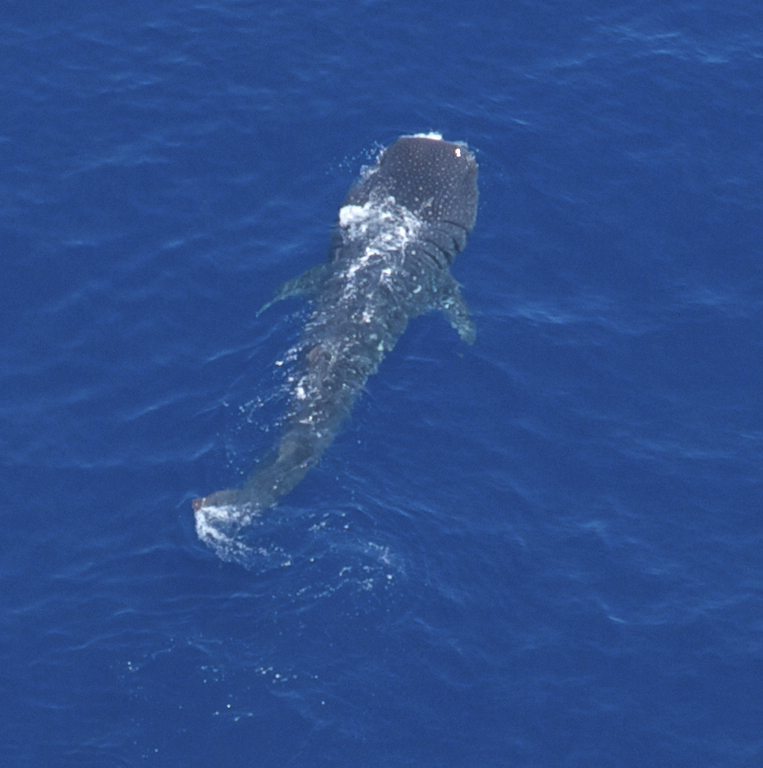 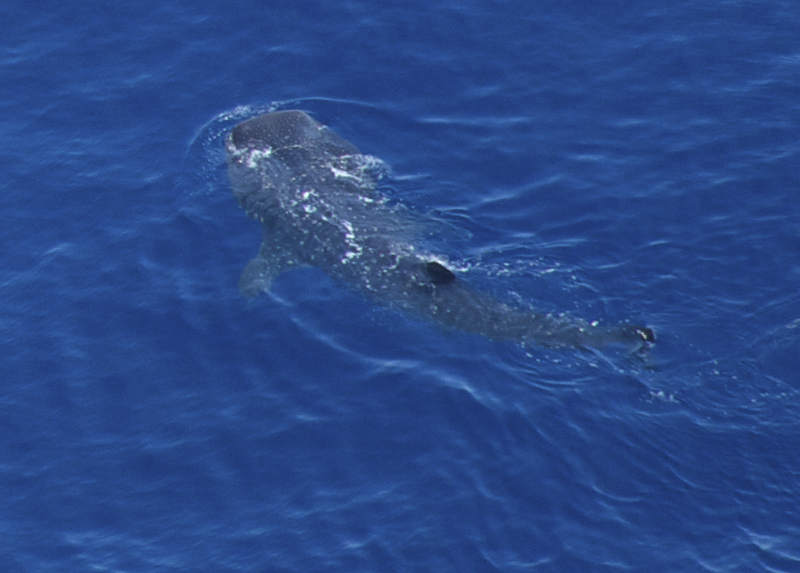 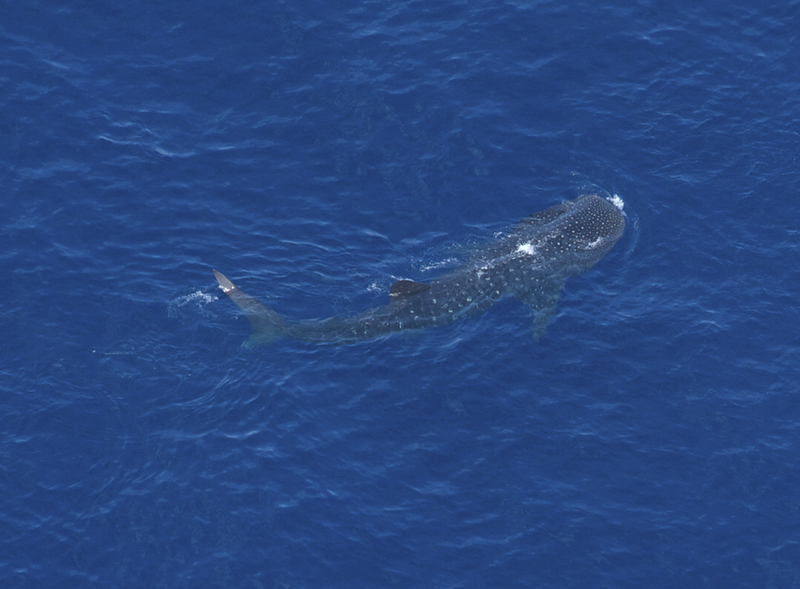 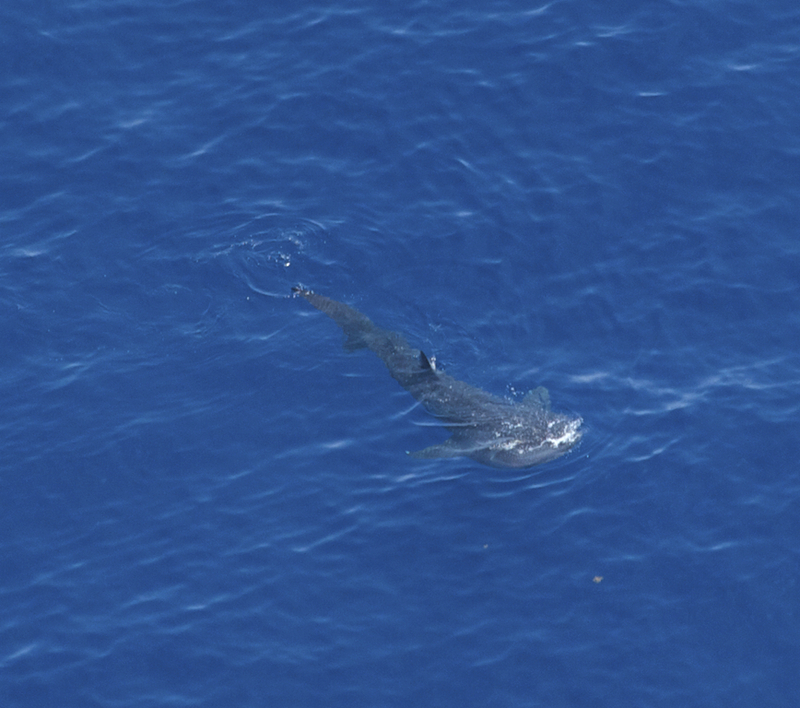 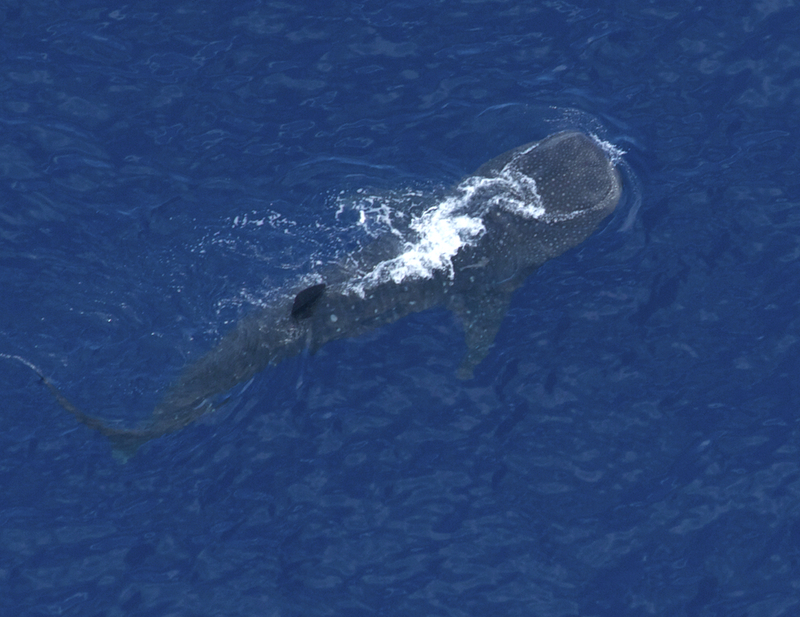 Finally, here are more whale-shark photos!